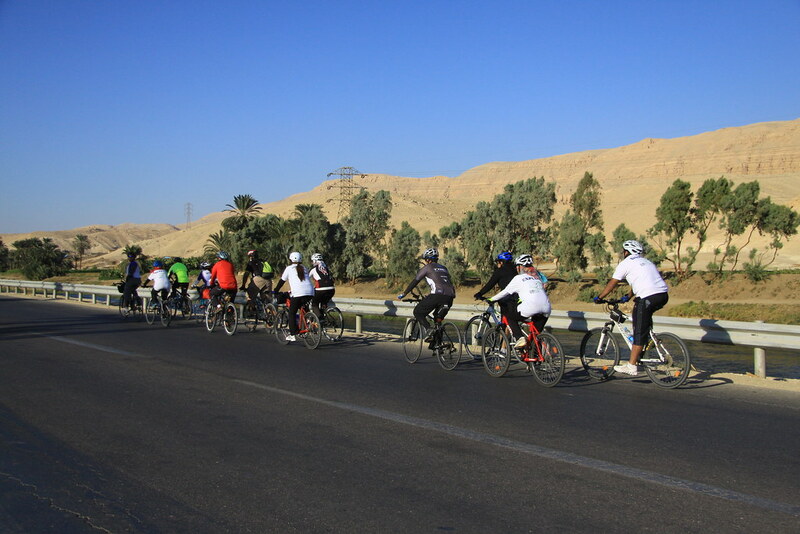 [13/12/13~16 (D+837) Egypt/Luxor to Aswan to Luxor] Valuable experience of cycling with dozens of local cyclists in Egypt. 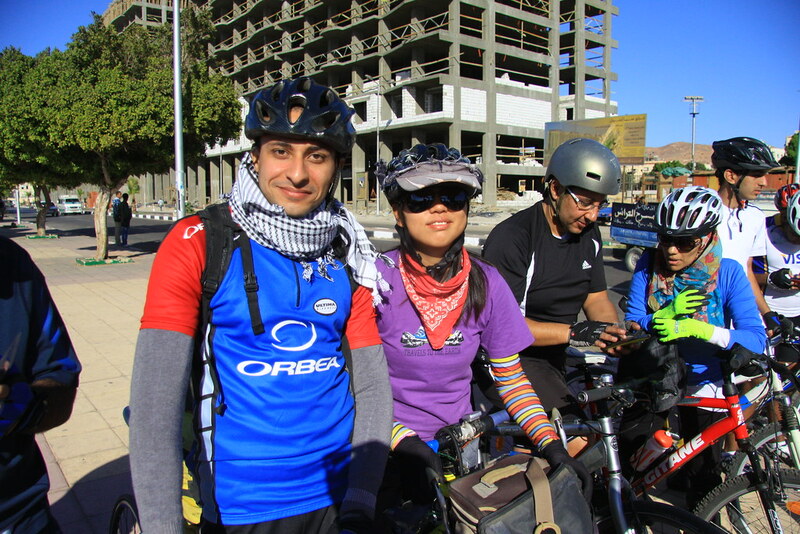 When I have the problem of cycling in the last country in Africa, many of Egyptians try to help me as cycling together for three nights and four days. In Egypt, women never cycle alone. 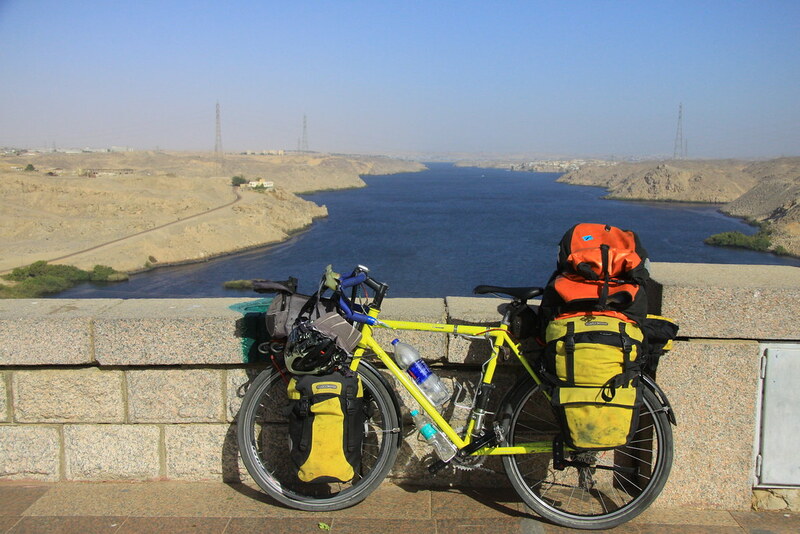 I found I should not cycle around Nile River in Egypt as a solo woman. So, I was looking on Facebook group for the people who can cycle with me. At that time, GBI Egypt team have contacted to me. 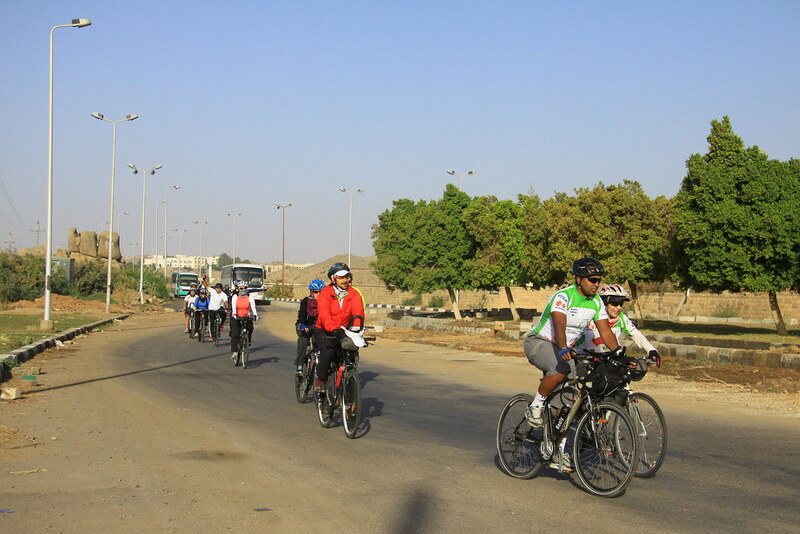 They said they have event, which is about to cycle from Aswan to Luxor for three nights and four days. They decide to invite me to their amazing annul event trip. All of them live in Cairo. 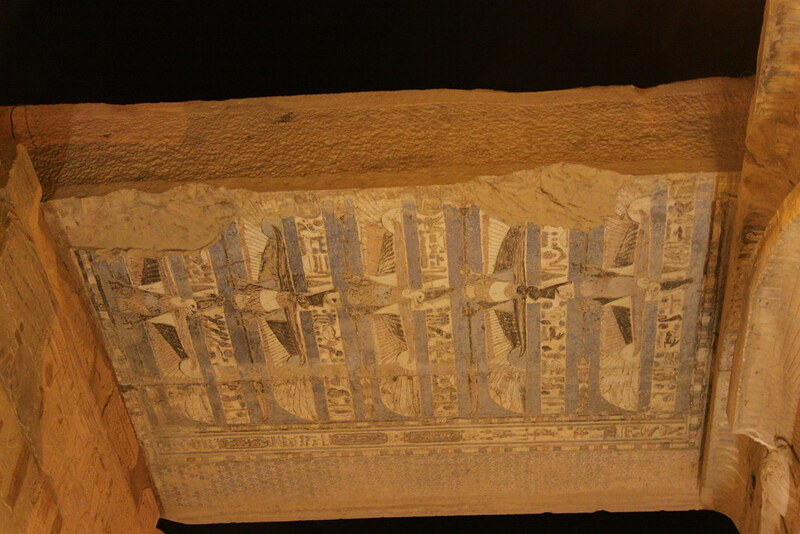 Some of them take the flight to Aswan and the other take the train. 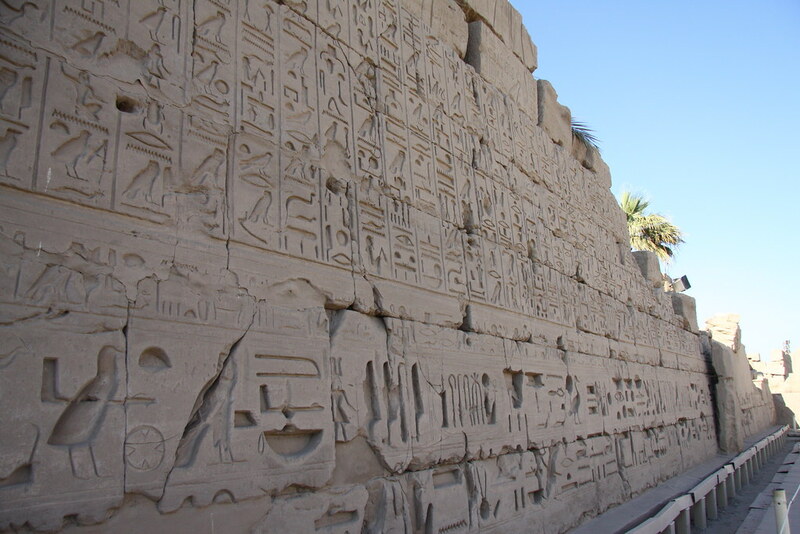 I join to their train from Luxor. The train is supposed to arrive at 5 am, but it is late. It is cold morning so that I use sleeping bag and sleep for two hours to wait them. Mostafa, who tries to organize everything for me, comes to me first and greets at me kindly. He helps me to take the train with my bike. It seems most of them can speak English that I don’t need worried about communication. 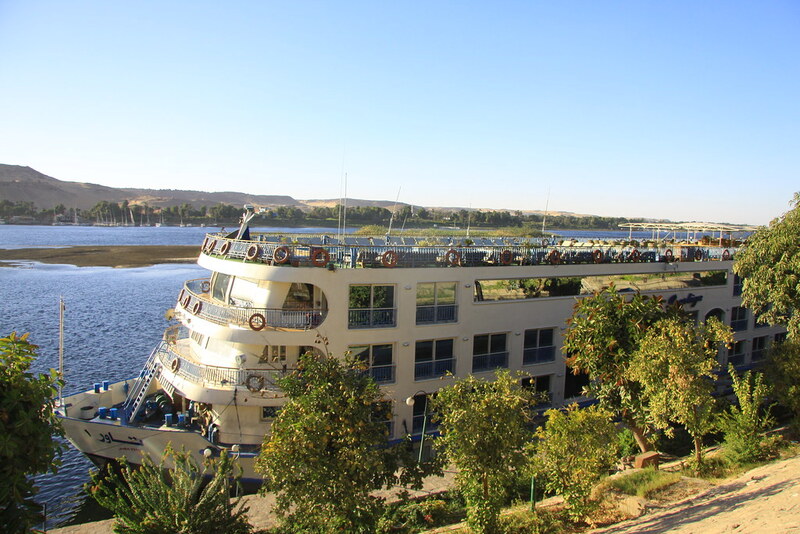 I come back to Aswan where I arrived from Sudan before. It is my first time to take cruise. Oh my goodness. Am I in the ship??? 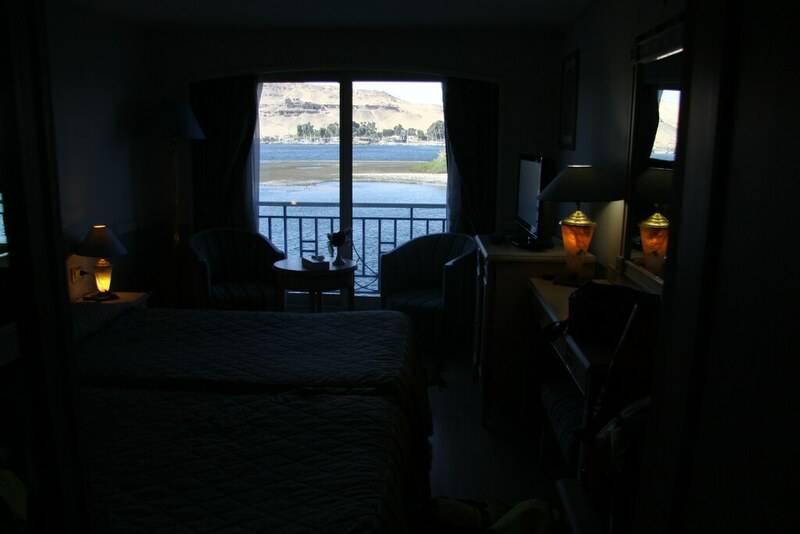 It looks like I am at the inside of hotel. Unbelievable!! I am budget traveler that I’ve never expect to spend a night in the cruise!!!! I was just looking for the people who can cycle with me. But look at this! I get much more things than what I need! Just incredible……………….. This is the room! 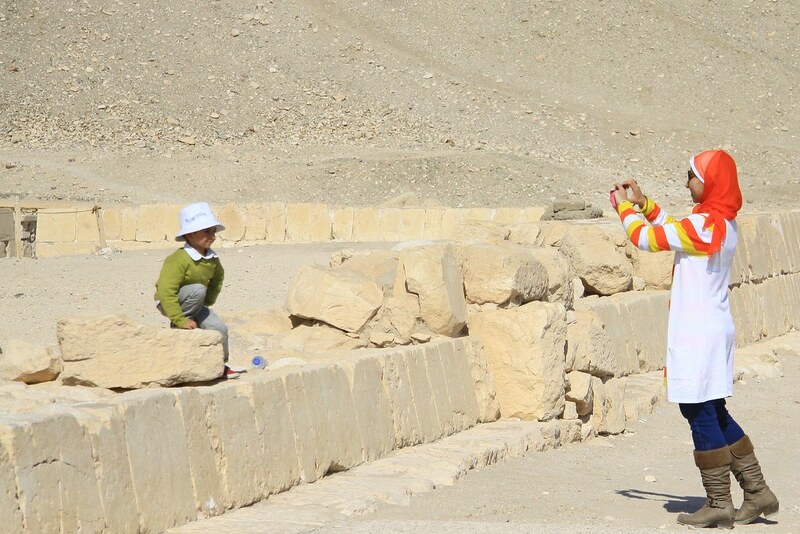 I share with another GBI Egyptian woman. Oh.. it is so beautiful view. I am not the only one foreigner. The guy from England, Shehzad, is another foreigner. His parents are from Pakistan, but he was born in England. We get along well, because we are only two foreigners. GBI, which is cycling club, starts by vodaphone’s worker in Europe. Now there are many GBI teams in Europe and Africa such as GBI Germany, GBI France, GBI Ghana and more. ( http://www.gbi-event.org/ ) They cycle for the charity every year in Europe. 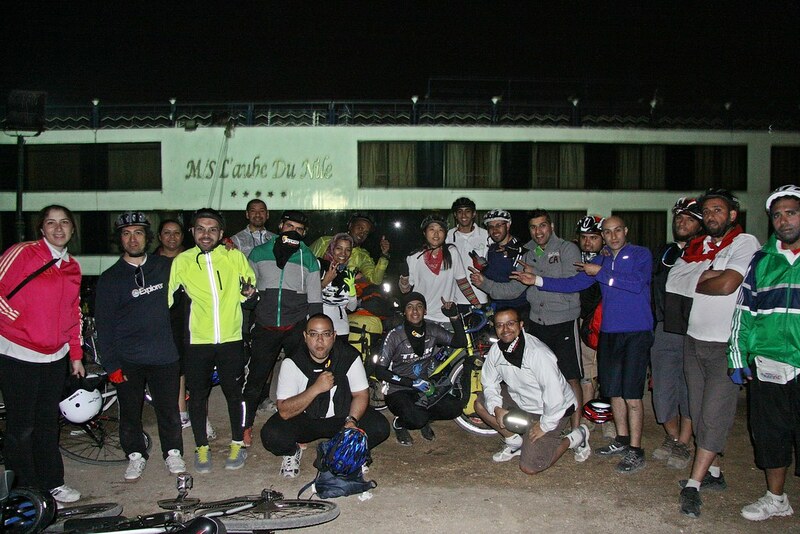 Shehzad met GBI Egypt team last year while cycling with GBI event and he decided to join this trip. 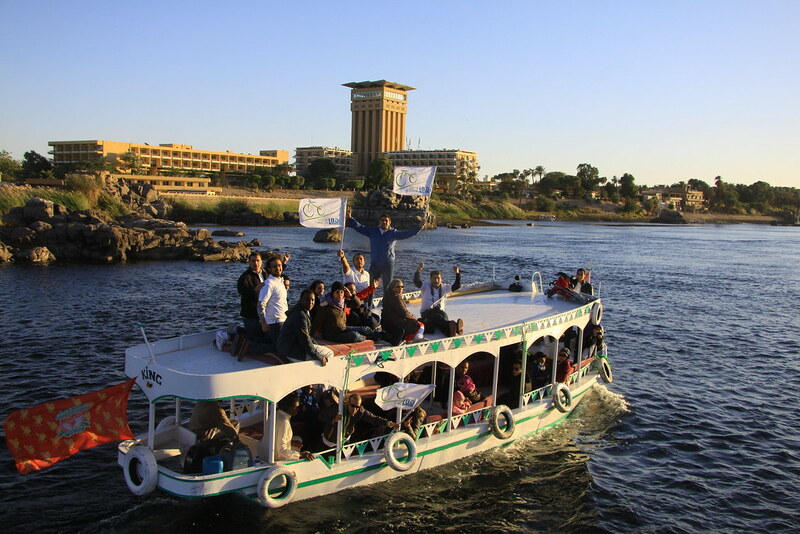 One of reason he joins is for her mother whose dream is to see Nile River. So he brings his mother and he will cycle along Nile River as well. 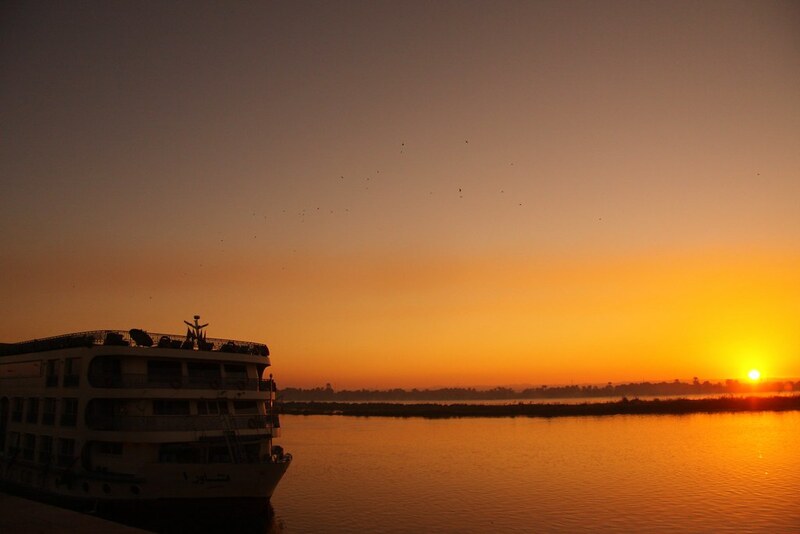 It seems like many foreigner’s dream is to see Nile River. 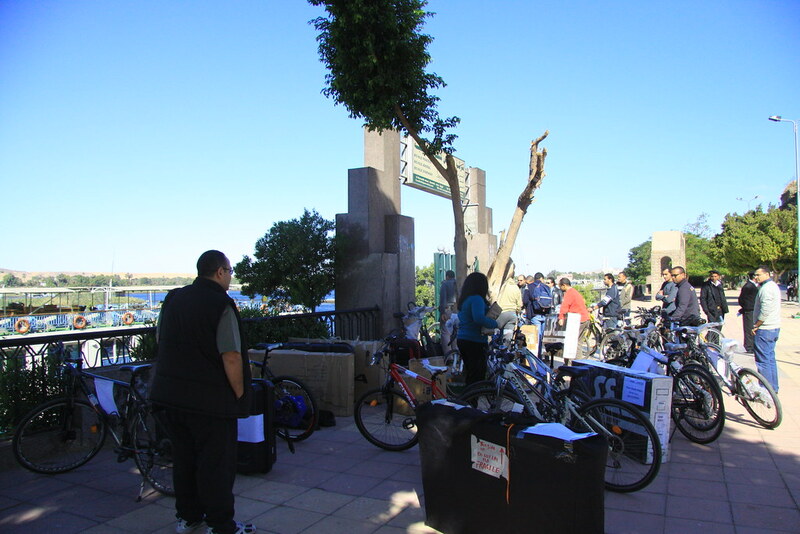 A big truck which takes many bikes arrives, and people starts being busy. At the afternoon we are going to Nubian cafe by a motor boat. This is their official t-shirt. It seems they love to be taken the photo. My shirt’s back is HAPPY. Yes, I am happy! It is good thing to hang around people who laugh and enjoy every moment. 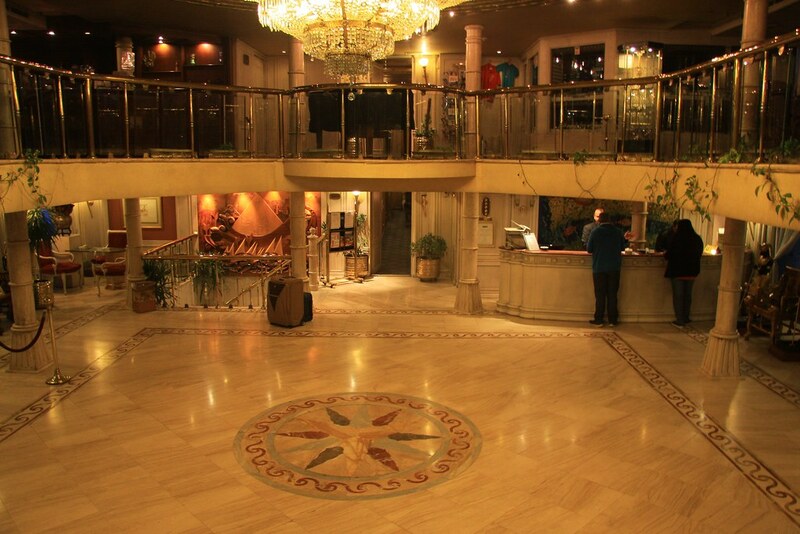 We visit the modern Nubian hotel, which looks very luxury. I though every Egyptians take camel so many times. But she says it is her first time. Oh!! I also try it. 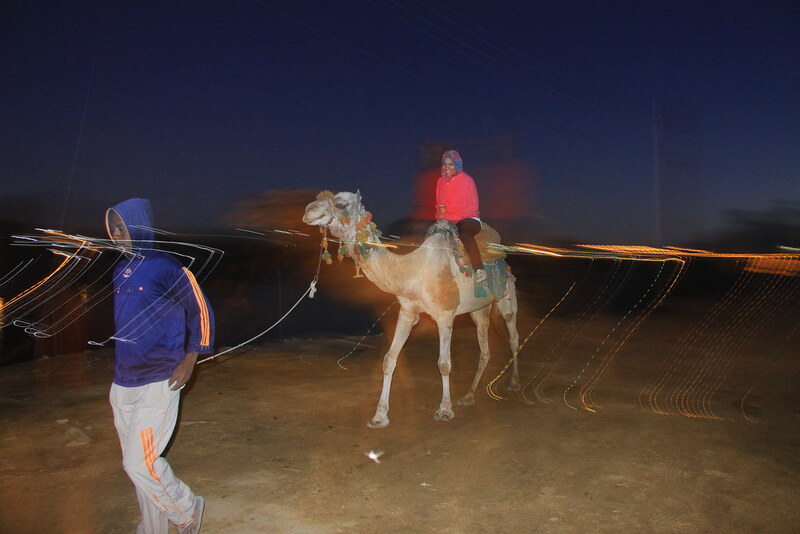 When a camel sits down and stands up, it is so thrill and exciting. But once the camel walk, it is uncomfortable. 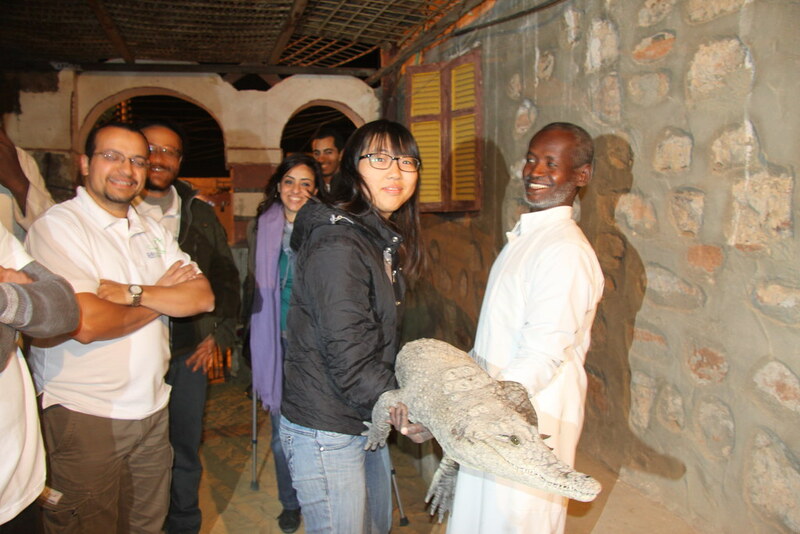 We visit some crocodile farm and lift it. Please don’t bite me! Their culture which I have seen from Sudan is very beautiful. Buffet. Buffet. Buffet. Buffet. Buffet. Buffet. 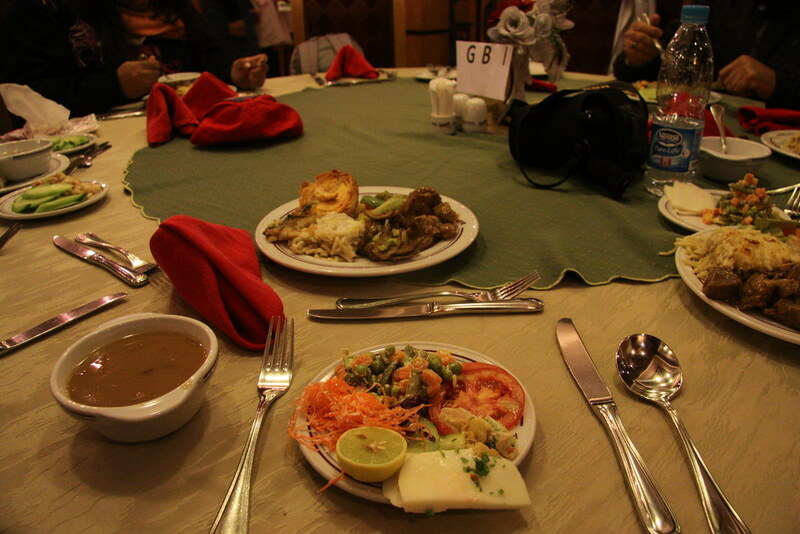 Breakfast, Lunch, Dinner.. there are lots of food. FOOD. FOOD. FOOD. FOOD. FOOD. Oh!!!!!!!!!!! I bring all of luggage from my room. People have kept asking me why I didn’t leave it to my room. I explain that it is on my way to Europe. But I think they don’t understand what I mean. I am so excited to cycle again that I am at the front group at first. When I take the rest with the group of head, the middle group passes us. AND……..It was my first time and last time to be at the front. After this photo, I’ve never been at the front. Hahahahahahaha. Always too much energy at first. But after then.. going back to normal as a slow cyclist. Hahaha. 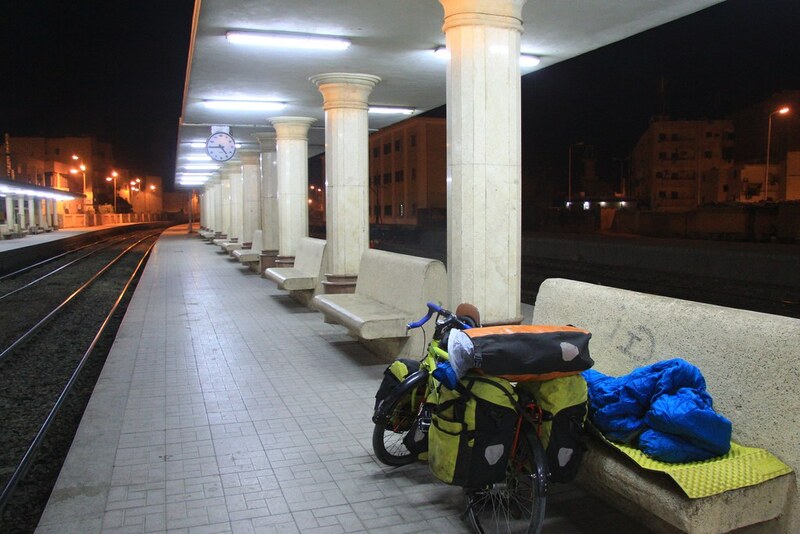 I feel some weird and then realize that I am cycling the way I cycled when I arrived from Sudanese ferry. It seems like we just hang around the cruise. When we arrive in High Dam, the families of GBI members already get by bus. Everybody looks so happy. Yeah to share experience of challenging is positive energy, which makes people happy. 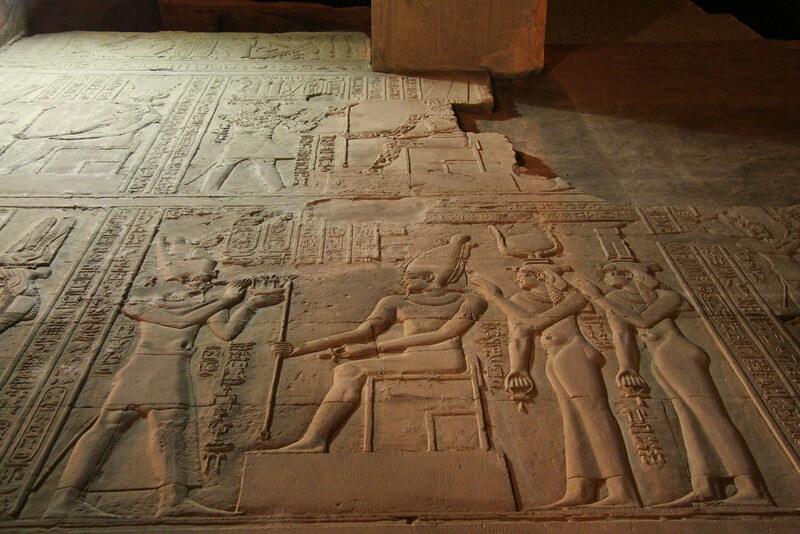 The Aswan Dam is an embankment dam situated across the Nile River in Aswan, Egypt. Since the 1960s, the name commonly refers to the High Dam. 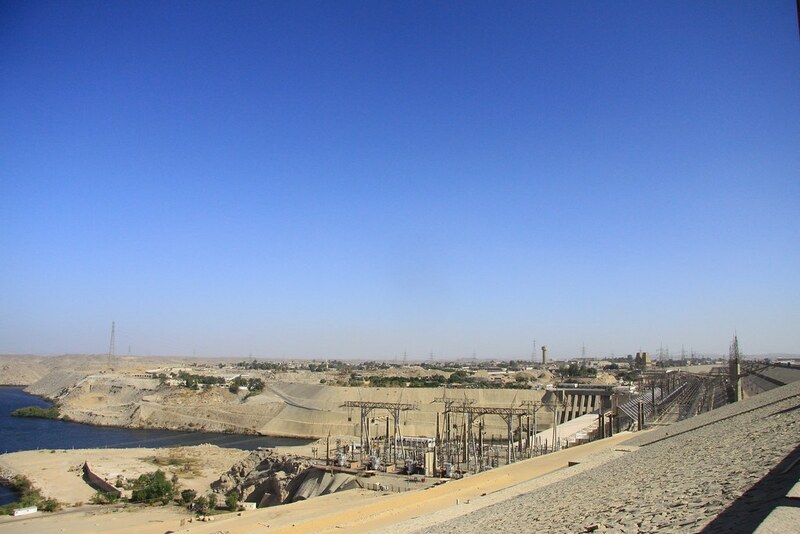 Construction of the High Dam became a key objective of the Egyptian Government following the Egyptian Revolution of 1952, as the ability to control floods, provide water for irrigation, and generate hydroelectricity were seen as pivotal to Egypt’s industrialization. 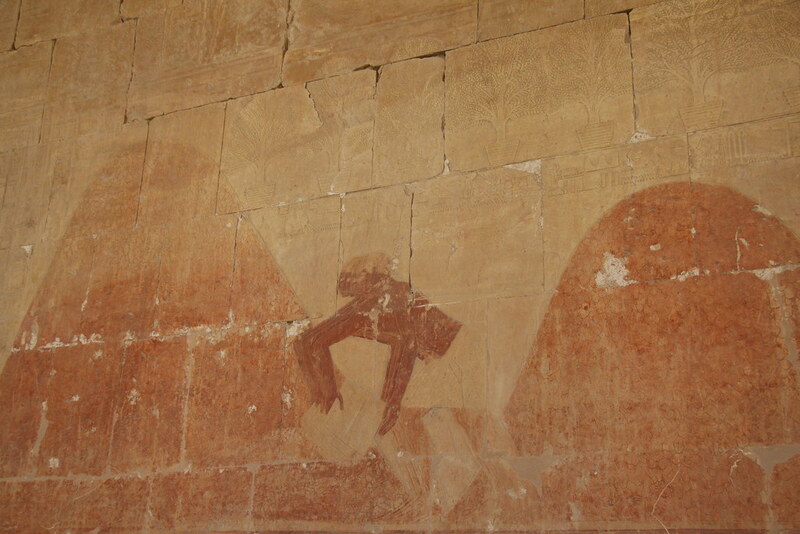 The High Dam was constructed between 1960 and 1970, and has had a significant impact on the economy and culture of Egypt. 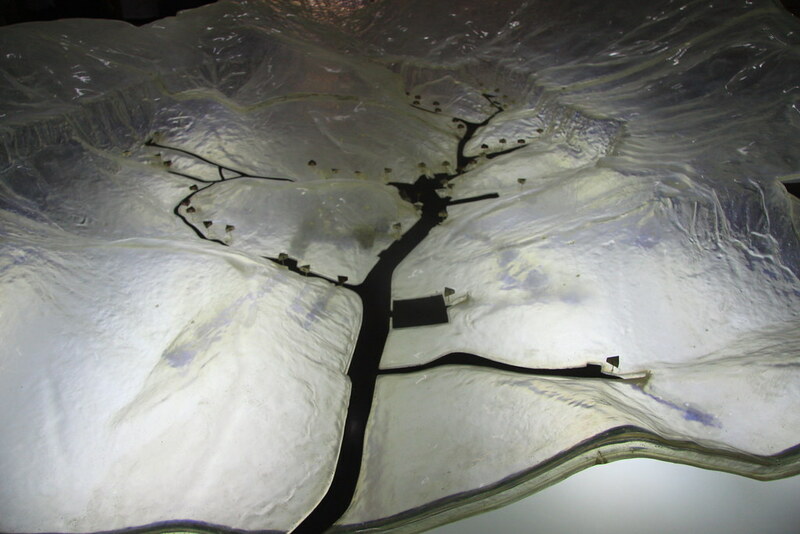 Before the dams were built, the Nile River flooded every year during late summer, when water flowed down the valley from its East African drainage basin. 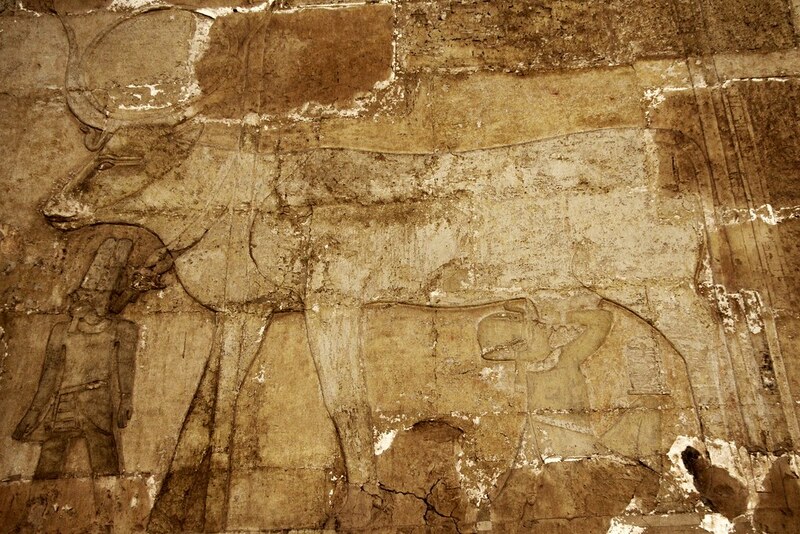 These floods brought high water and natural nutrients and minerals that annually enriched the fertile soil along the floodplain and delta; this had made the Nile valley ideal for farming since ancient times. Because floods vary, in high-water years the whole crop might be wiped out, while in low-water years widespread drought and famine occasionally occurred. 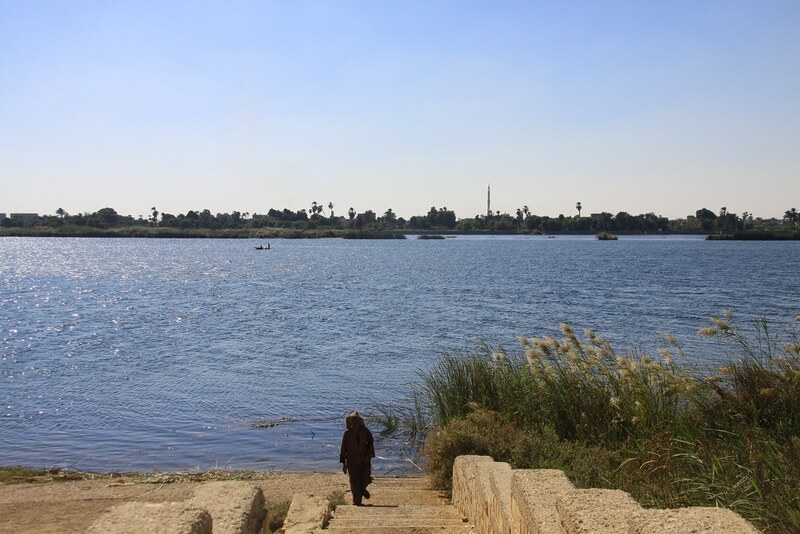 As Egypt’s population grew and conditions changed, both a desire and ability developed to control the floods, and thus both protect and support farmland and the economically important cotton crop. 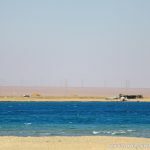 With the reservoir storage provided by the Aswan dams, the floods could be lessened and the water stored for later release. After touring High Dam, I am so slow to move again that I am the last one starting cycling. Already everybody left. It thanks that one of members waits me and cycles together. While I cycle with a local tall man, one local guy blocks the road and plays like a crab. I imagine that if I cycle alone, everything would be the worst. My friend shouts at him in Arabic loudly. Hey friend! AWESOME!!! GOOD JOB!!! GBI Egypt team invites me to all of Temple they visit. 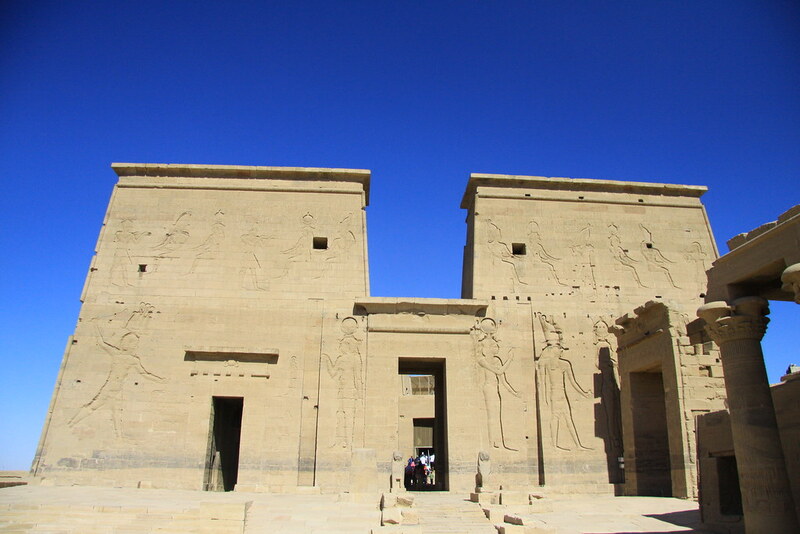 So, I visit Philae temple again. 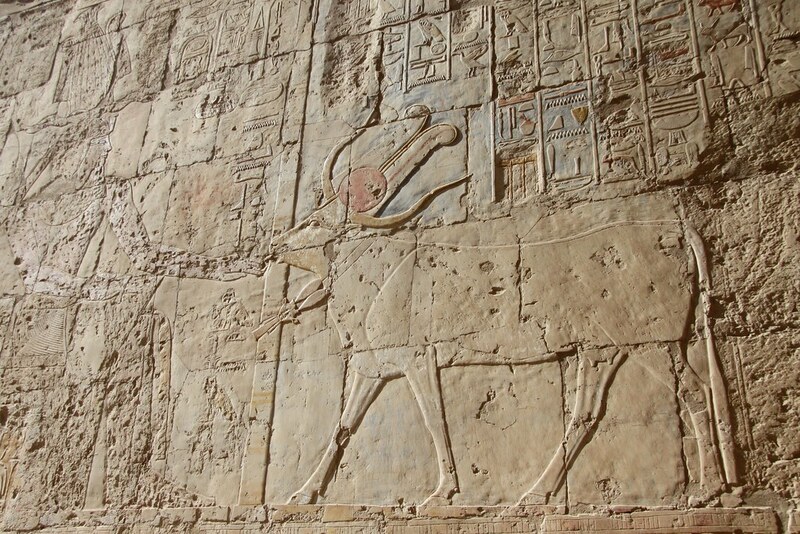 This is human instinct, which wants to leave some comment at ruins. Look at this. 1823!!! The Roman builds something at the temple as well. 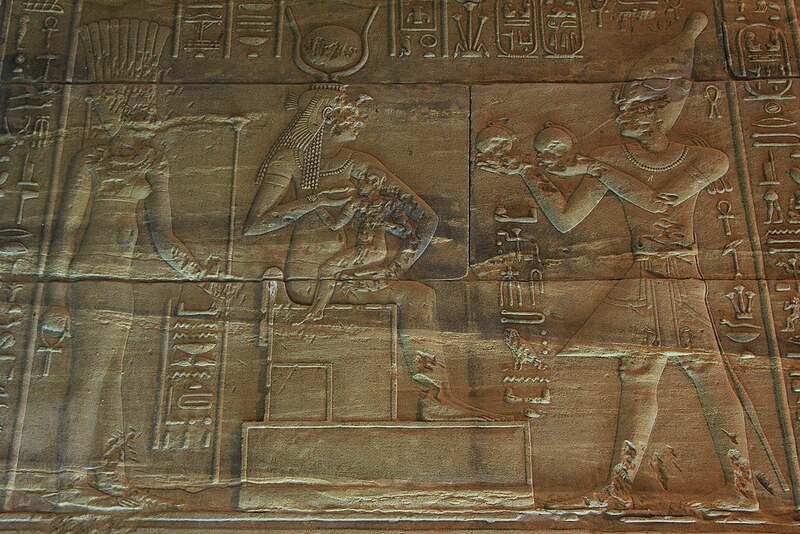 Hathor is taking care of Pharaoh. 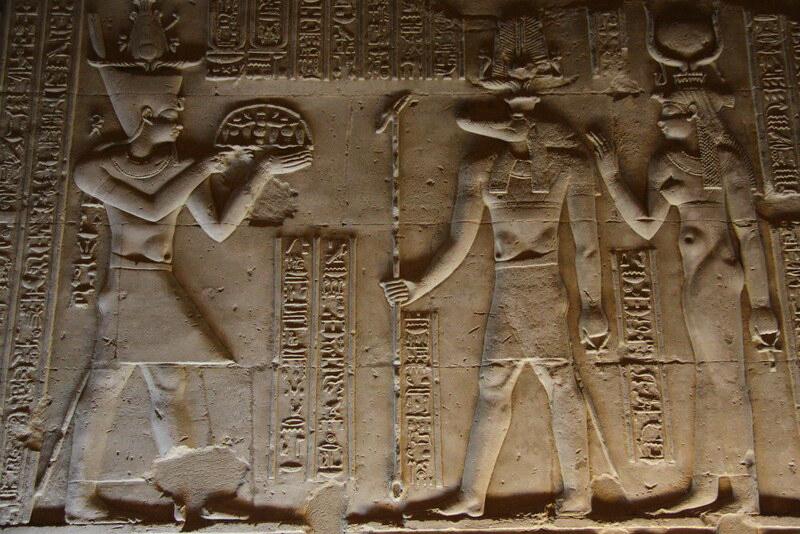 How do I know this is Hathor? 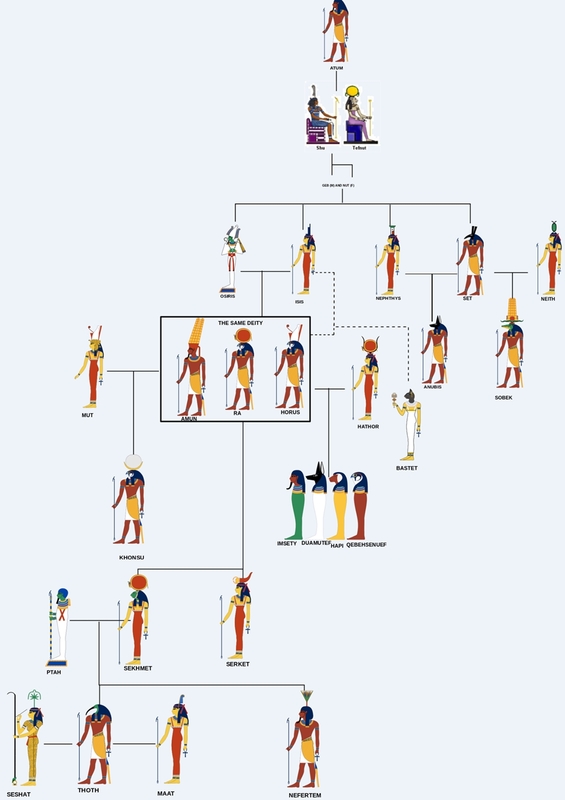 Here is the ancient Egyptian god family tree. It is more fun if I know more about their history. 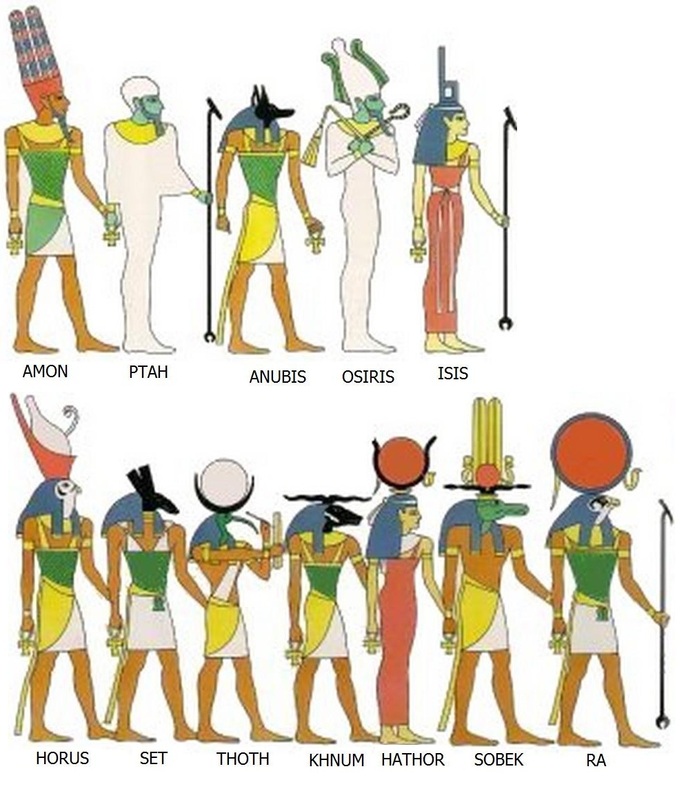 Here is the time line of ancient Egyptian. After touring, we cycled a few kilometers more. I am surprised that we did just round trip. Oh.. I didn’t know that I though we are moving to the next city. 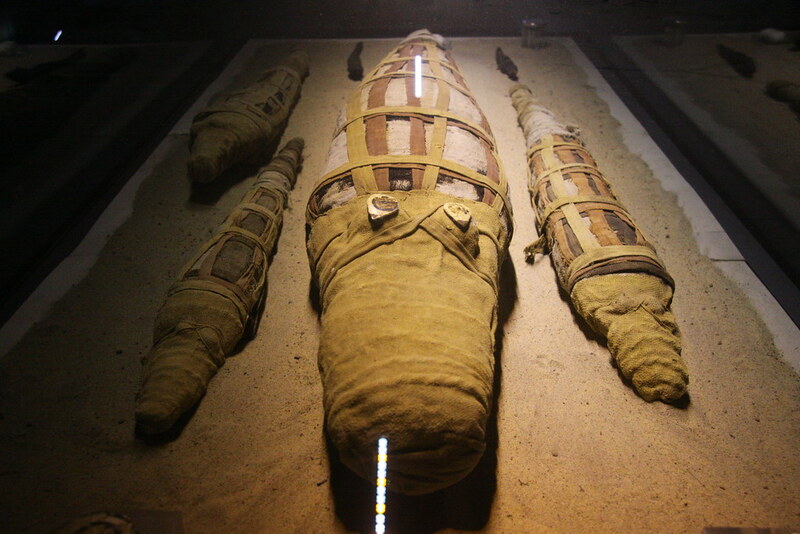 I am sure Egyptians are too wondering why I carry every luggage for round trip. Hahaha. We arrive at the cruise around 12:40pm. It is told that the cruise will depart at 1 pm to the next city. The one who wants to cycle at the afternoon must get out of the cruise before 1 pm. It means lunch time is only about 10 minutes. I put food to my mouth as much as I can quickly. While I do mission thing about eating food quickly, in front of me the one guy who gave me information of departure time of the cruise eats very slowly. I though he loves cycling very well. But it seems he will not cycle at the afternoon, and he will take just the rest at the cruise. Ahmed is very kind to me that it is good to talk with him. But he cycles so fast usually that I can see him only at the beginning or ending of cycling. Hahaha. We have to cycle over 50 km (31 mi) in five hours. It is too much to me that I am not sure I can make it. Actually I was worried about my speed. But Mostafa said there are three groups that I don’t need worried about it. I carry all of luggage as normal before. It is good thing that there is a supporting car which carries lots of FOOD. FOOD. FOOD. HURRAY!!! The way to wharf is narrow local secondary road, and the herd of a goat is going back to their home. But they start jumping crazily, because we pass them so fast. I go fast as well, because I am afraid of being behind alone. Then one of goats changes his direction to me too suddenly that there is no time to use the brake. I just hit his belly. My speed is 20 km/h (12.5 mi) that just as soon as I crash him, I roll over. My bags are thrown away and my body is thrown away as well. What the accident at the in front of destination?? People stops cycling and helps me. They keep asking me I am okay and everything is okay. Fortunately I cover all my skin with clothes that I don’t see any blood. One of them says the goat is okay that he keeps running and jumping to his home even after getting crash. It is my first experience that many friends are worried about my accident IN FRONT OF ME. I’ve had many small accidents while cycling around the world over two years, but all the time I was alone and I had to take care of myself. We arrive around 6:30 pm. 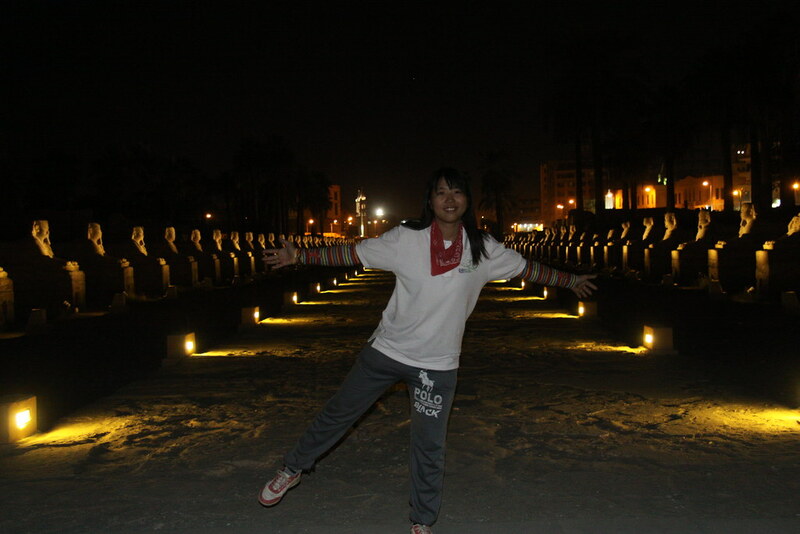 In front of cruise, there is a Kom Ombo temple. 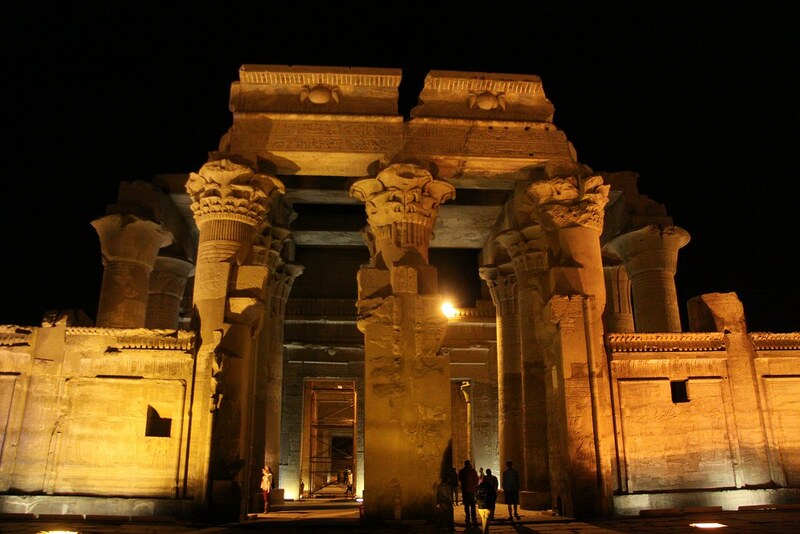 The Temple of Kom Ombo is an unusual double temple built during the Ptolemaic dynasty in the Egyptian town of Kom Ombo. 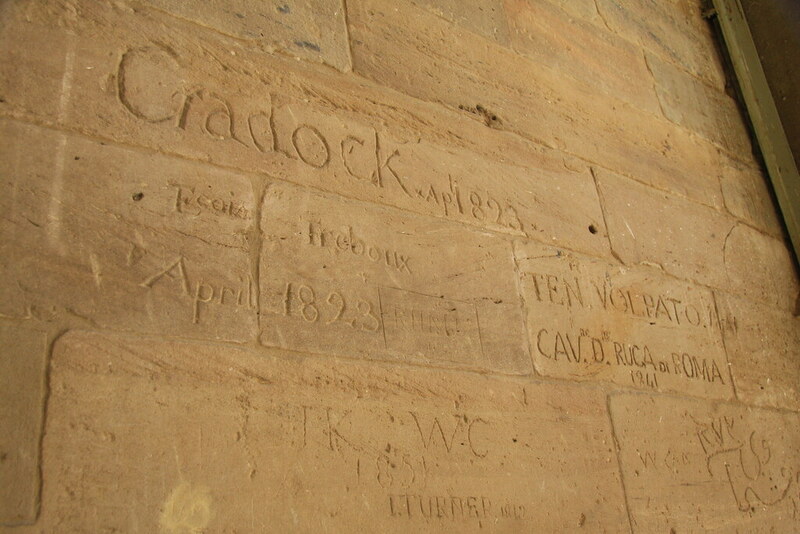 Some additions to it were later made during the Roman period. 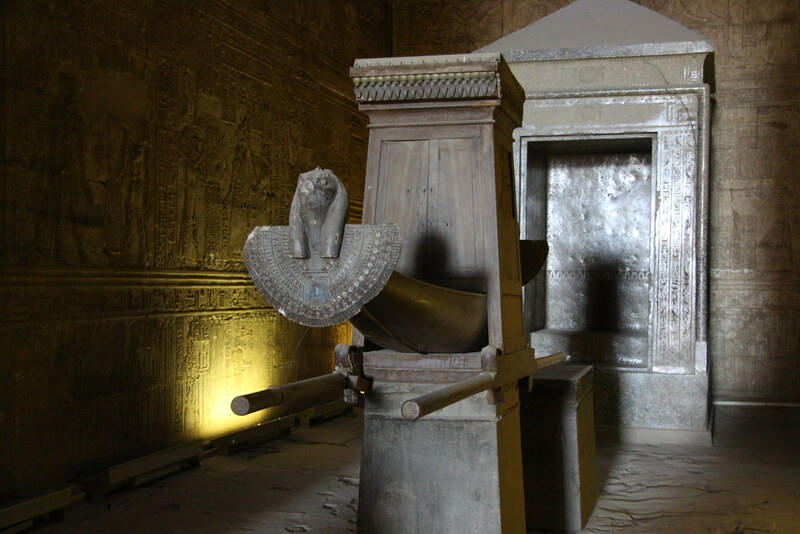 The building is unique because its ‘double’ design meant that there were courts, halls, sanctuaries and rooms duplicated for two sets of gods. 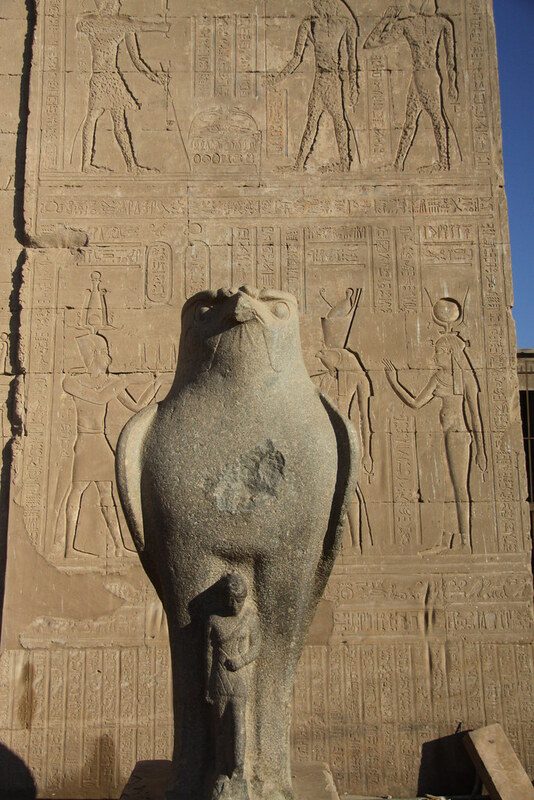 The northern part of the temple was dedicated to the falcon god, Horus. 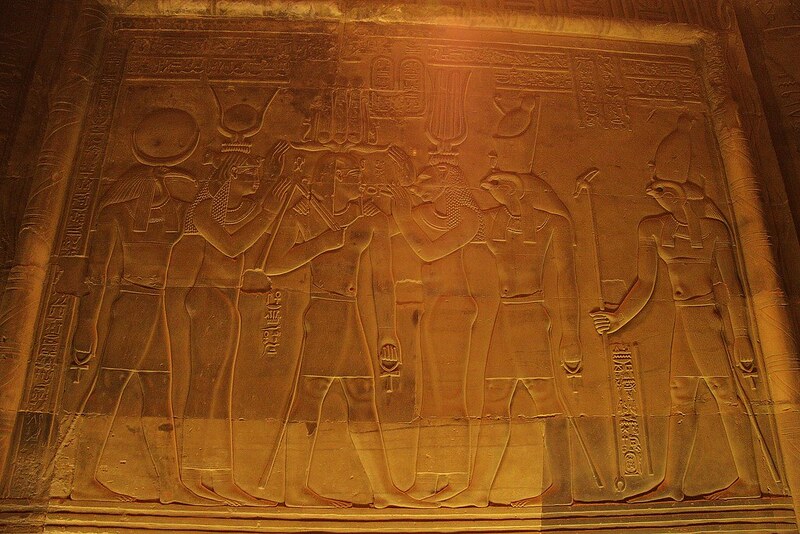 The according to the photo I upload about gods family tree, from the left it is Thoth, Hathor, Phraoh, Sekhment, and Horus. 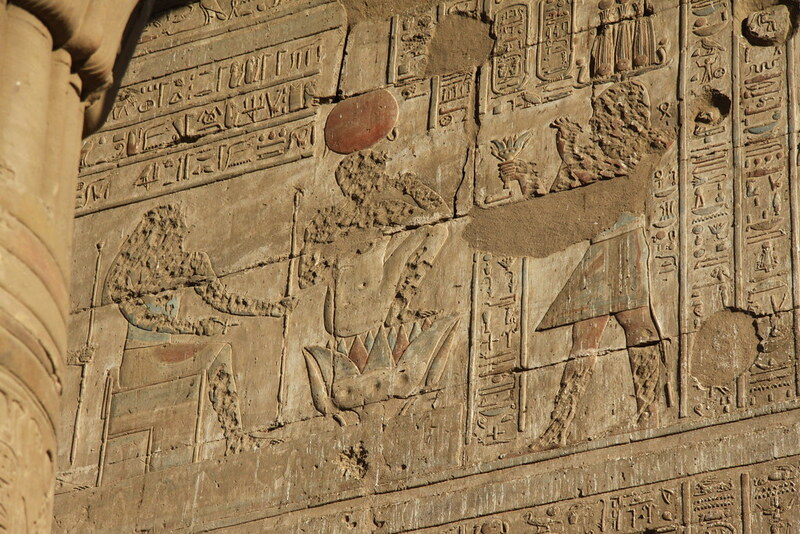 The southern half of the temple was dedicated to the crocodile god Sobek, god of fertility and creator of the world with Hathor and Khonsu. 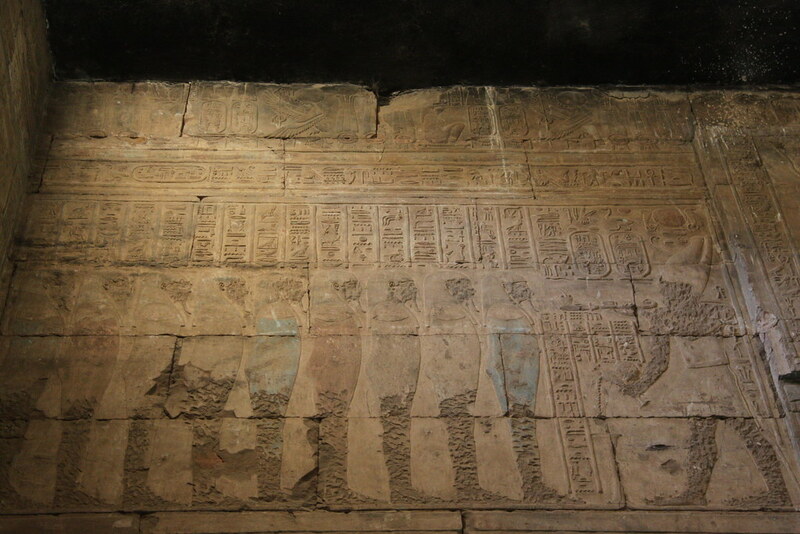 There are full of wall carving. I am wondering how they’ve done this huge jobs. 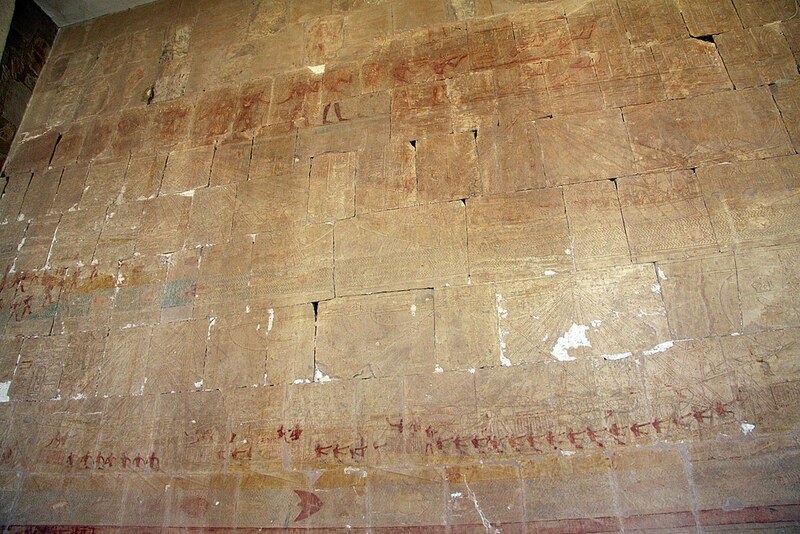 The calendar shows the figures for the days of the month and the hieroglyphics for the inundation season Akhet. 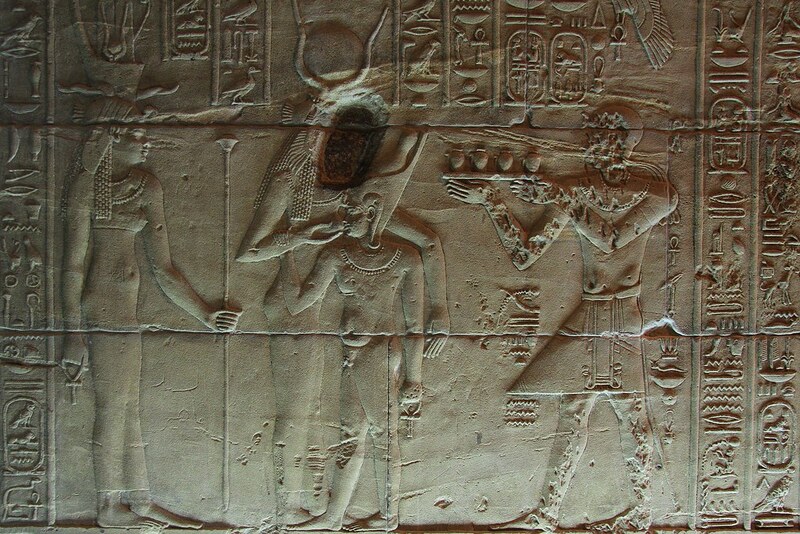 On the thirtieth of the month of the Shemu one can see the hieroglyphic for Peret, which indicates the end of the harvest season. 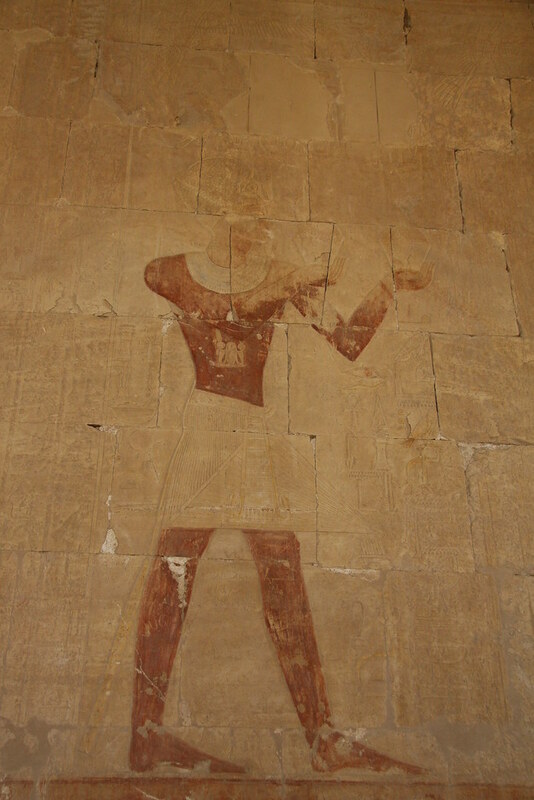 The next day is Akhet. 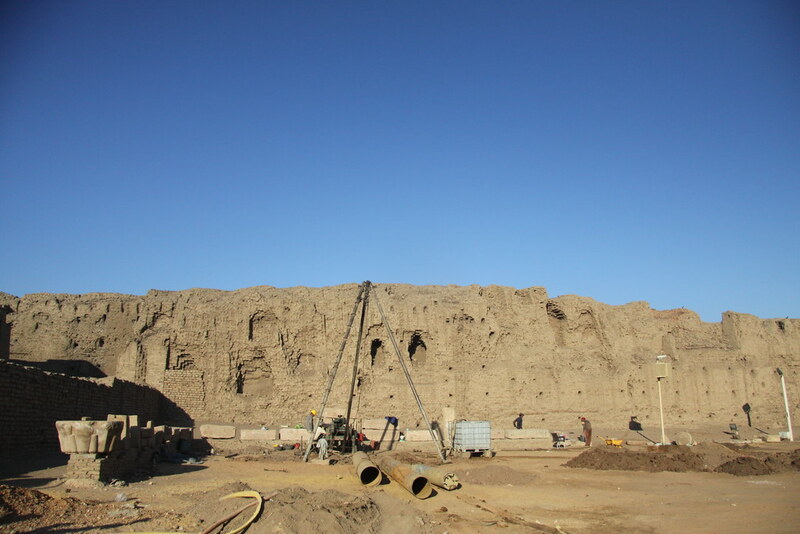 Although it is passed over 2000 years, we can still see the color of ruins. To see the temple in the night is much gorgeous. 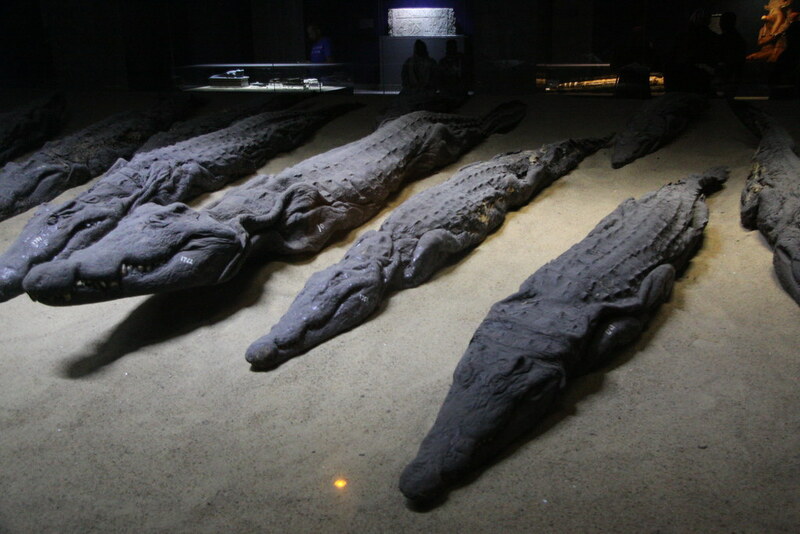 A few of the three-hundred crocodile mummies discovered in the vicinity are displayed in The Crocodile Museum. The next morning everything is so quiet and peaceful. I don’t have serious injured from yesterday accident that I can cycle without problem today. 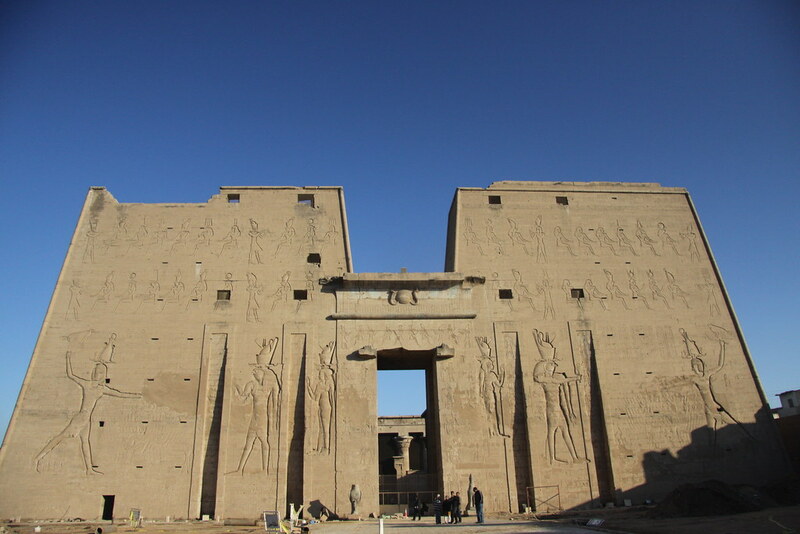 The Temple of Edfu, dedicated to the falcon god Horus, was built in the Ptolemaic period between 237 and 57 BCE. 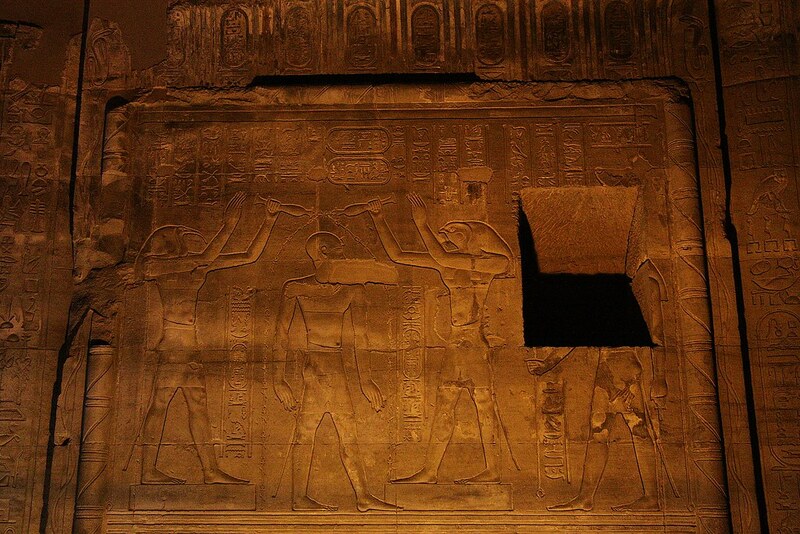 It looks similar to Philae temple. 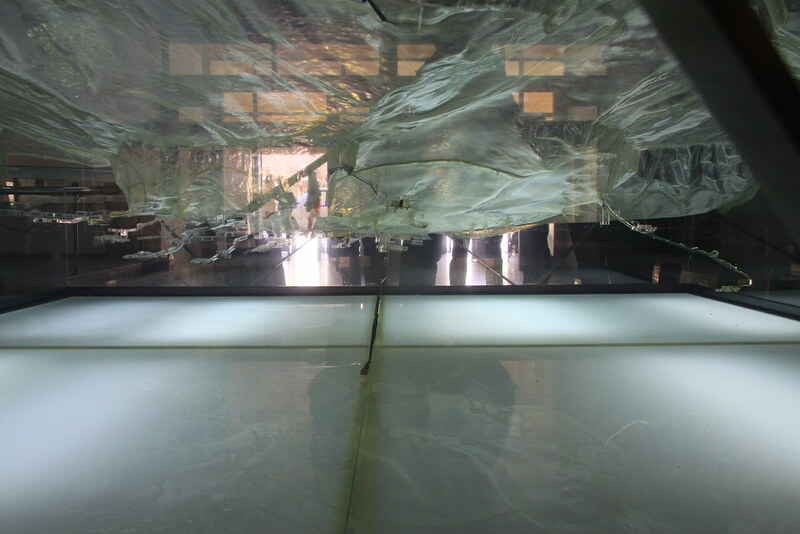 The water flows just under the ground that it makes ground weak and damage temple. So, they are trying to remove water. 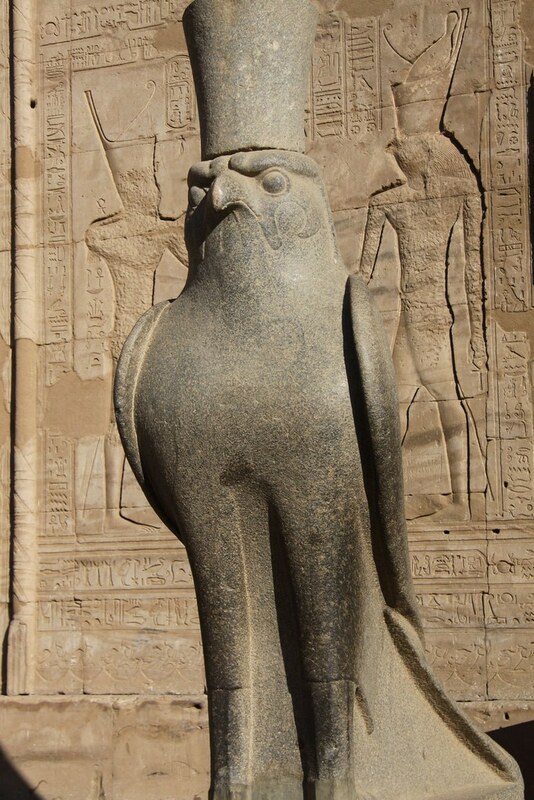 Statue of Horus. It looks like Angry Bird. 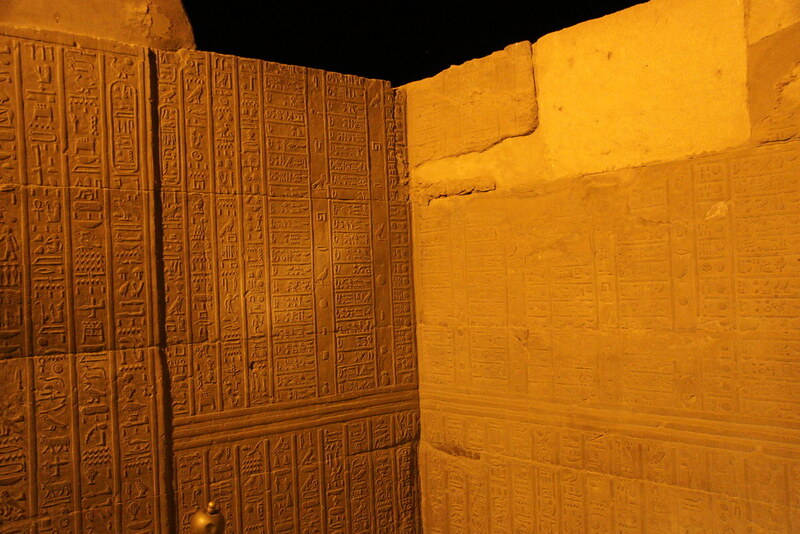 The inscriptions on its walls provide important information on language, myth and religion during the Greco-Roman period in ancient Egypt. 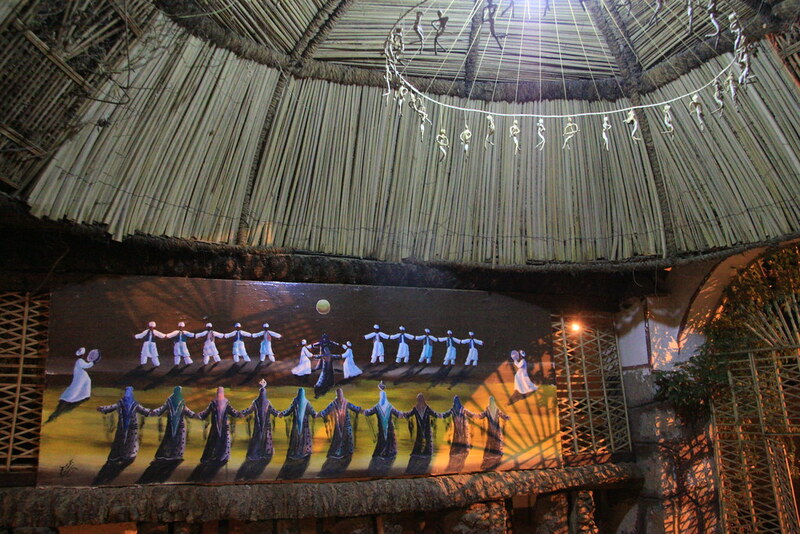 Inside the sanctuary at the centre of the temple. After quick touring in the morning, we start cycling. One of good things to cycle together with GBI team is that we have a supporting car which carries food and drinking. I am so happy that I can cycle along Nile River again. Many other cyclists in GBI keep asking me that why I carry all my luggage, why not to leave at the cruise today as well. I think nobody understands why I bring panniers from the cruise. There is always a police supporting. 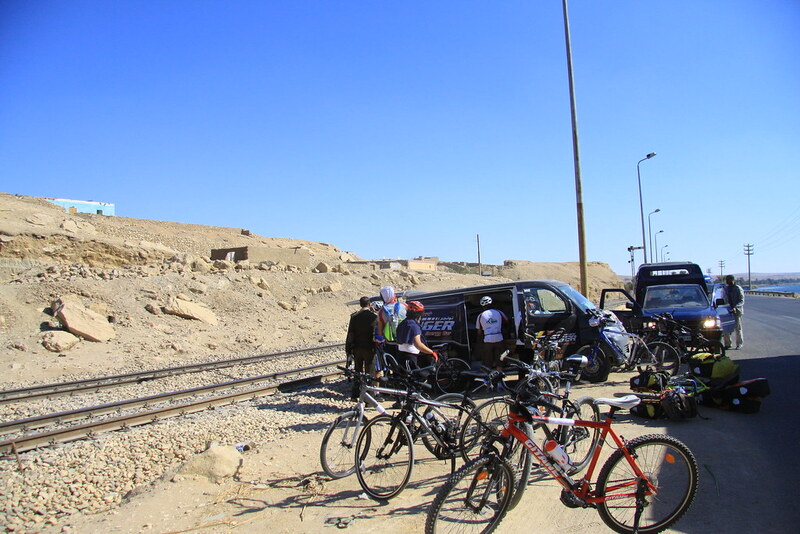 It is really hard to catch team with full of luggage, but I enjoy so much cycling all together with Egyptians. 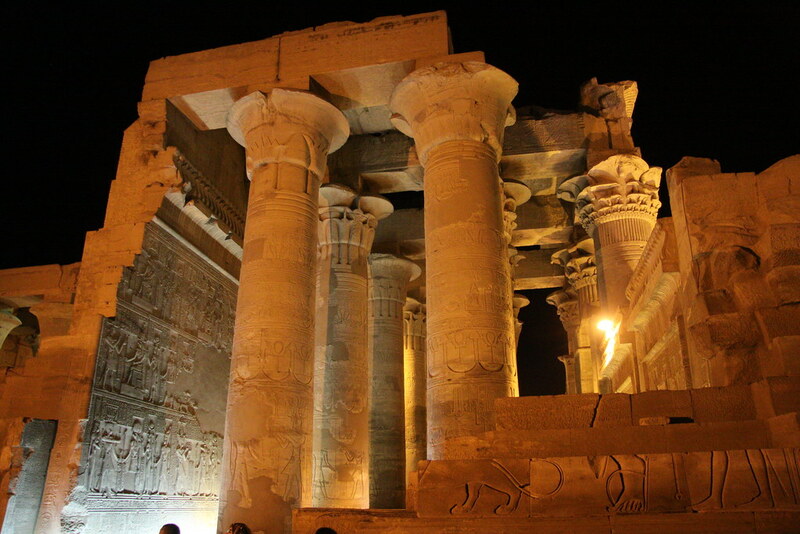 As soon as arriving in Aswan, we visit Luxor temple. 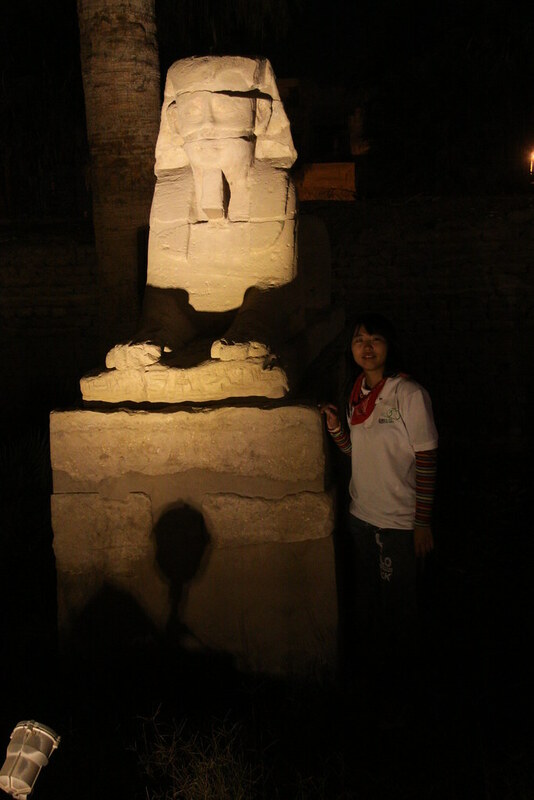 To tour temple in the night makes me feeling more mysterious and gorgeous. 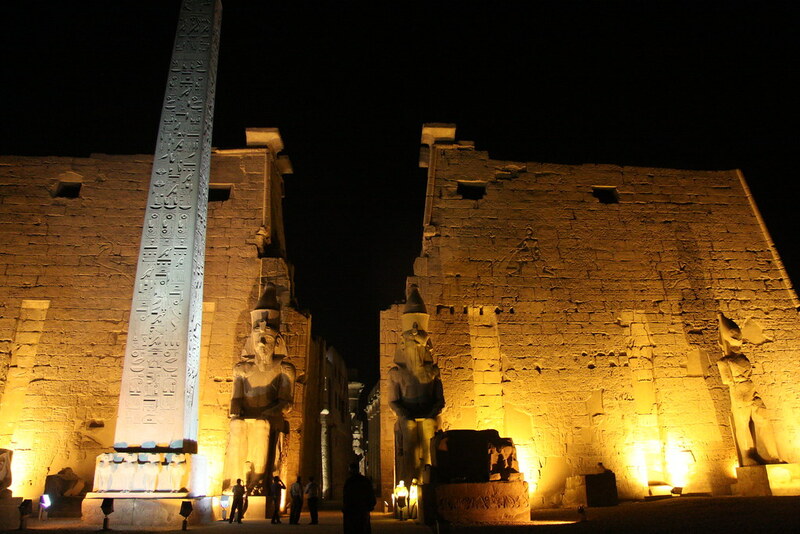 Luxor Temple was founded in 1400 BCE. 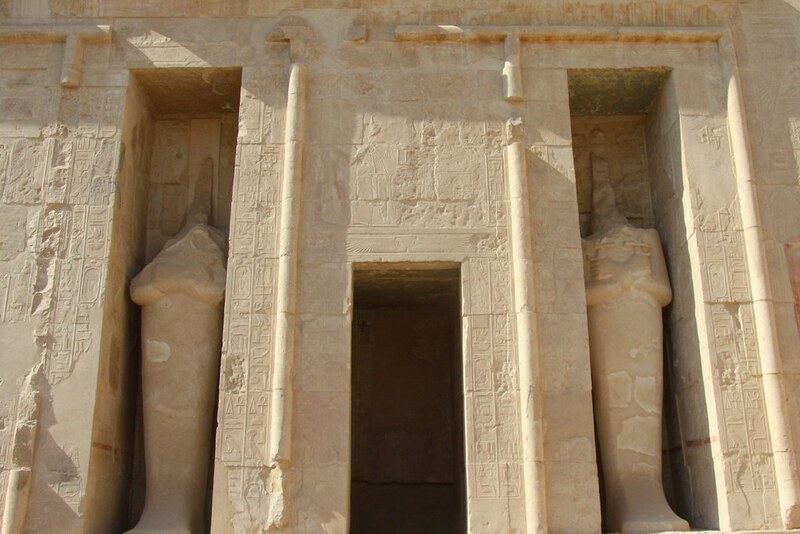 It was dedicated to the Theban Triad of the cult of the Royal Ka, Amun, Mut, and Khonsu and was built during the New Kingdom. 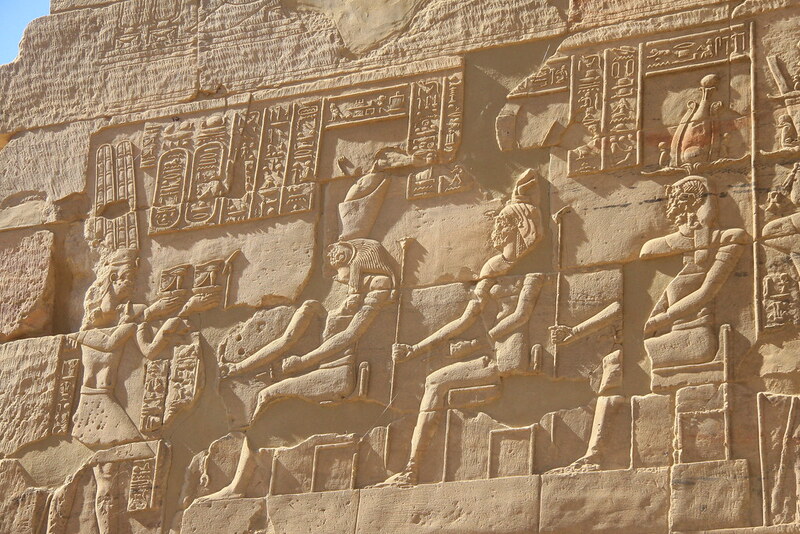 The temple was built with sandstone from the Gebel el-Silsila. 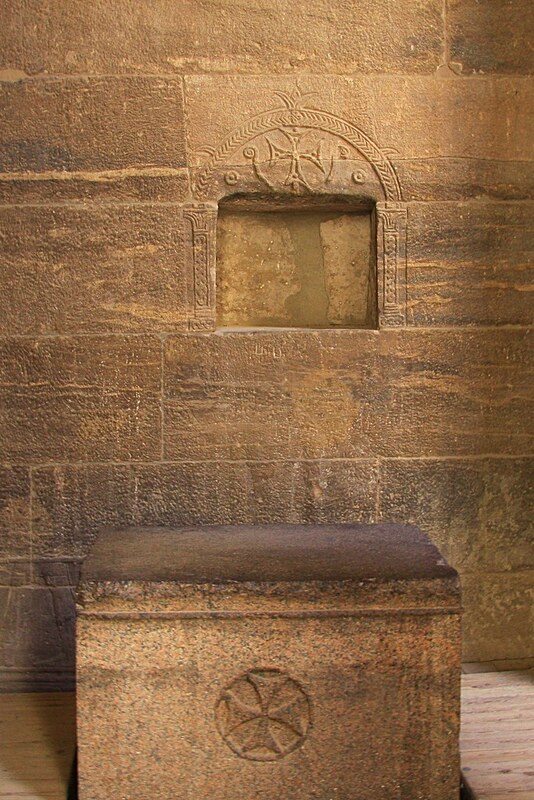 This sandstone was used for the construction for monuments in Upper Egypt as well as in the course of past and current restoration works. It is the photo for celebration of 22,000 km. Thank you for taking picture together! Today is the last day that we don’t cycle but tour. 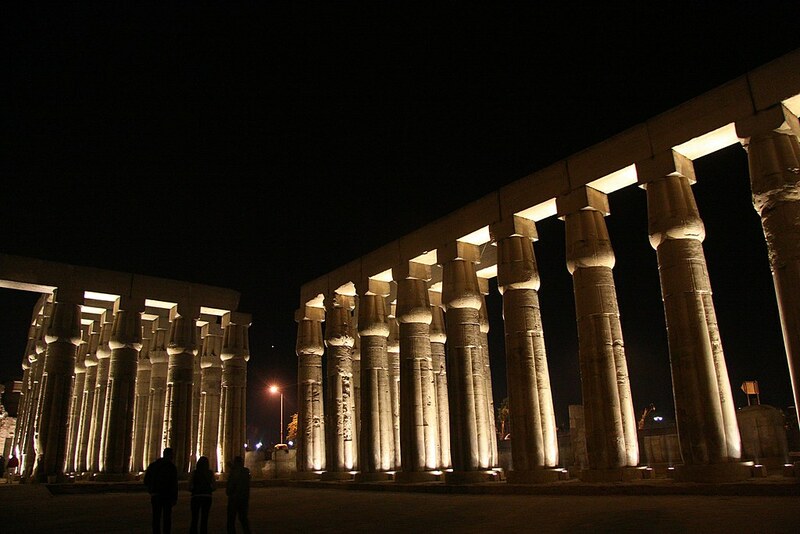 The first place we visit is Colossi of Memnon. 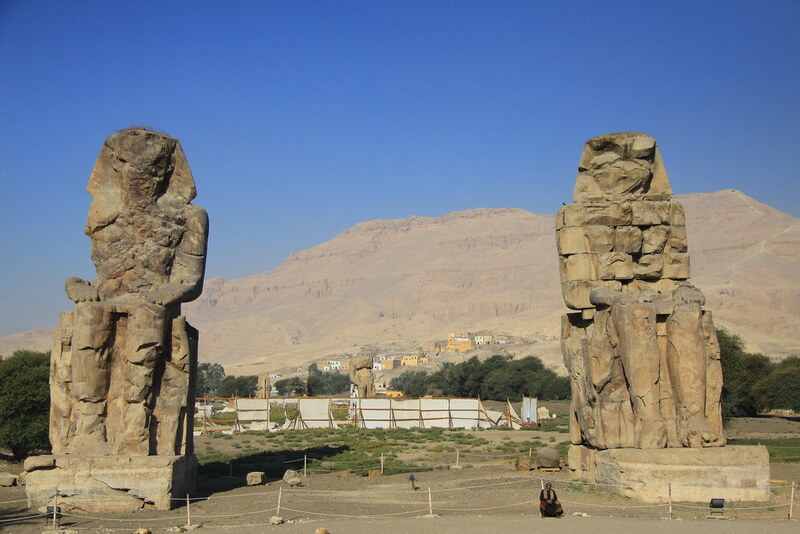 Colossi of Memnon are two massive stone statues of Pharaoh Amenhotep III. 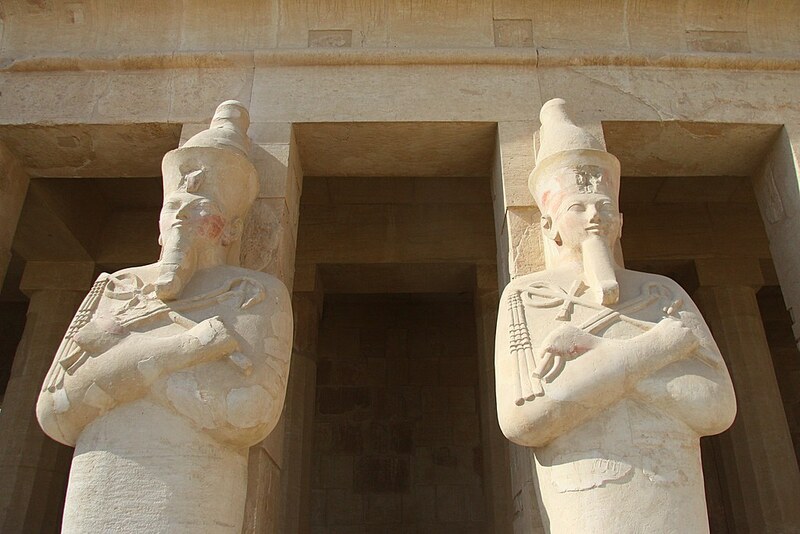 For the past 3400 years they have stood in the Theban necropolis. 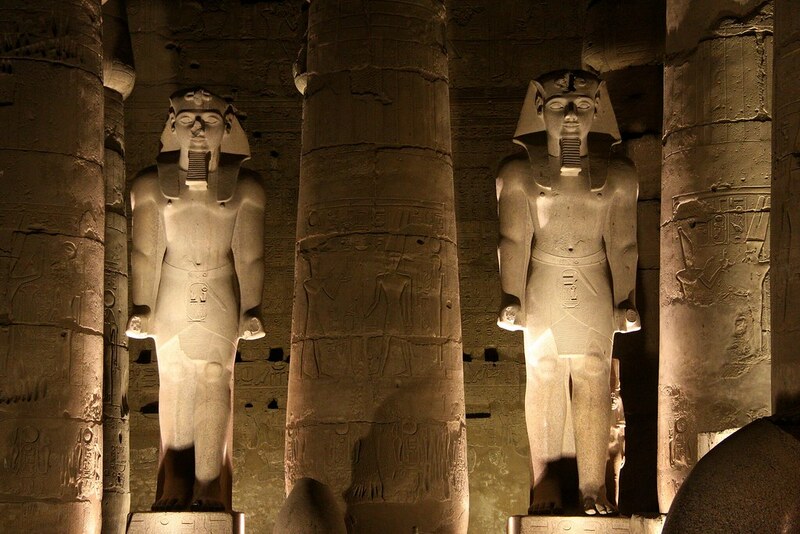 The statues are made from blocks of quartzite sandstone which was quarried at el-Gabal el-Ahmar (near modern-day Cairo) and transported 675 km (420 mi) overland to Thebes. 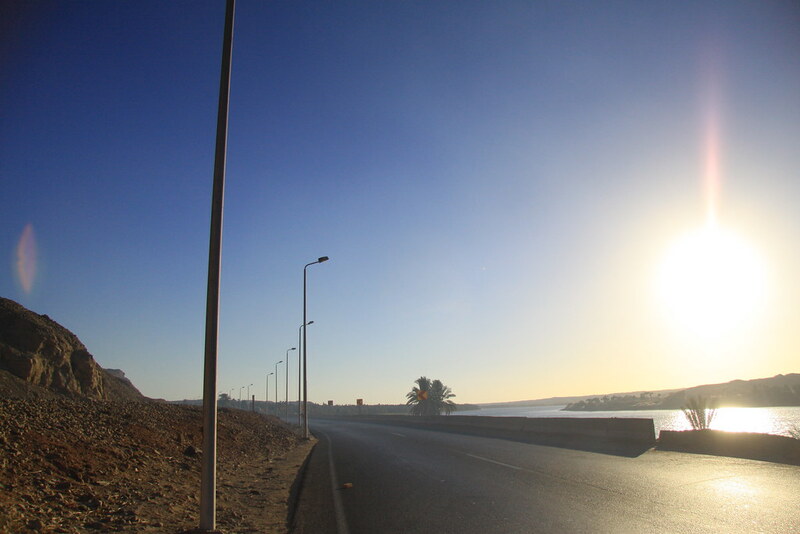 Thanks to them, I could cycle from Aswan to Luxor without problem. Amazing experience! 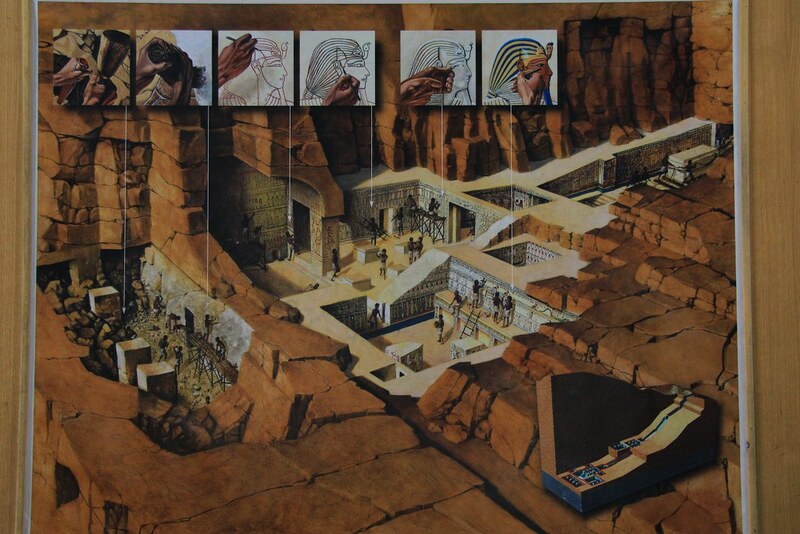 Valley of the Kings is a valley in Egypt where, for a period of nearly 500 years from the 16th to 11th century BC, tombs were constructed for the Pharaohs and powerful nobles of the New Kingdom. 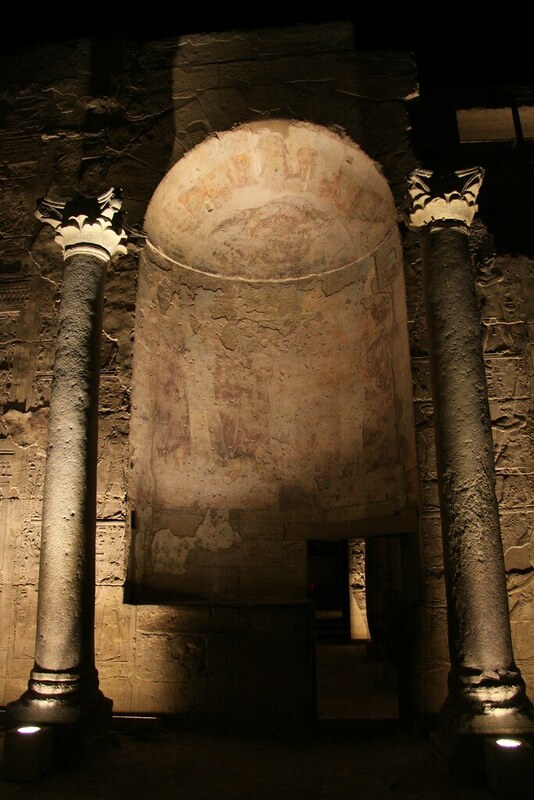 The valley is known to contain 63 tombs and chambers. It is not allowed to take the photo. The above the photo is from google image. 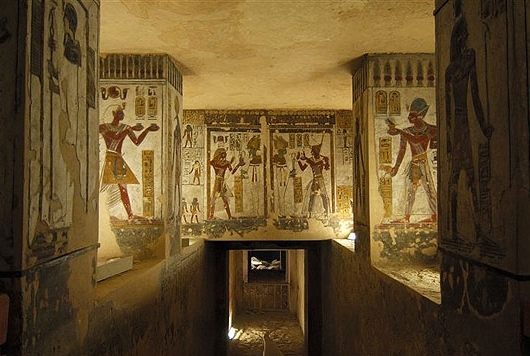 There are only two tombs which tourist can visit. But tourists have to pay for each one. I visit one of them. 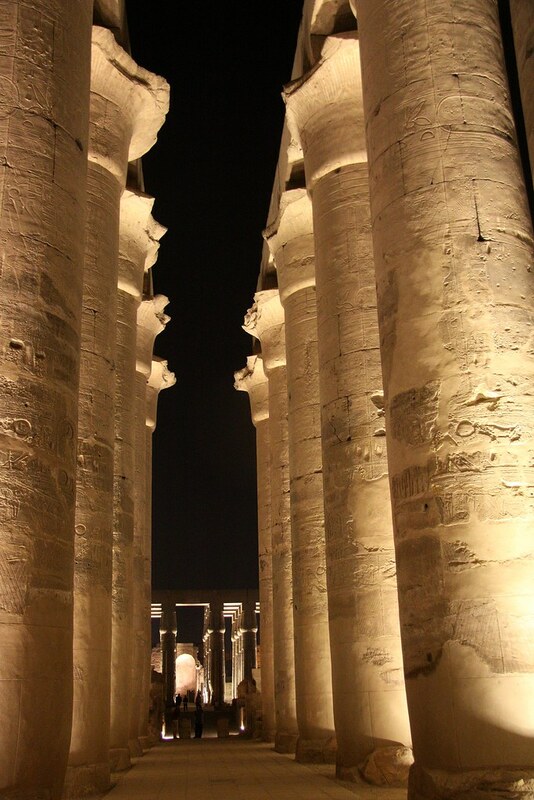 It is the most beautiful place I’ve been in Egypt. It is fantastic colorful amazing. 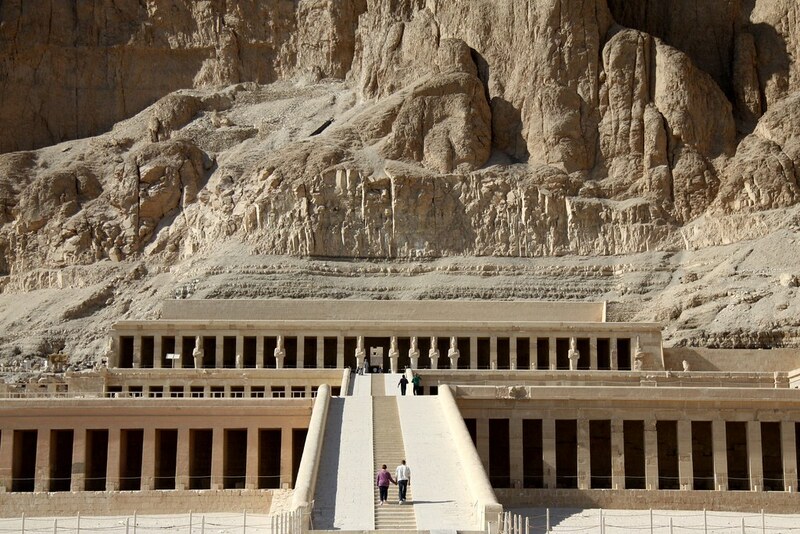 The next temple we visit is the Mortuary Temple of Queen Hatshepsut. 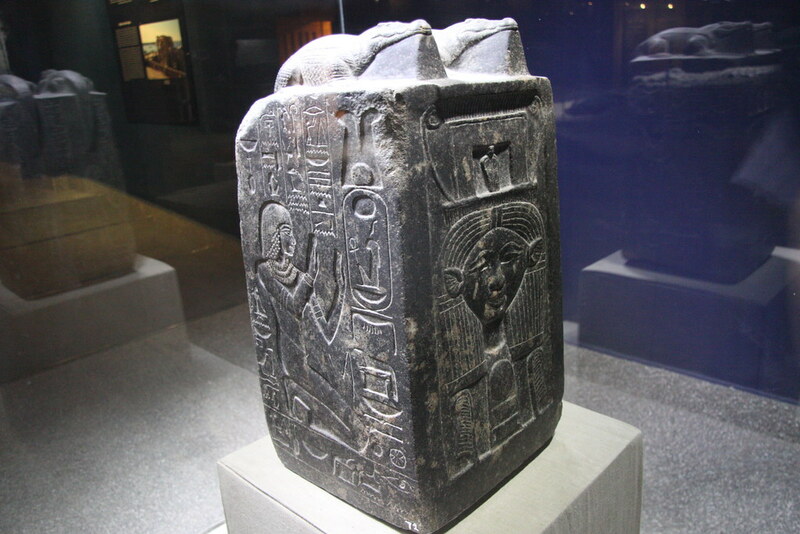 Although it was uncommon for Egypt to be ruled by a woman, the situation was not unprecedented. 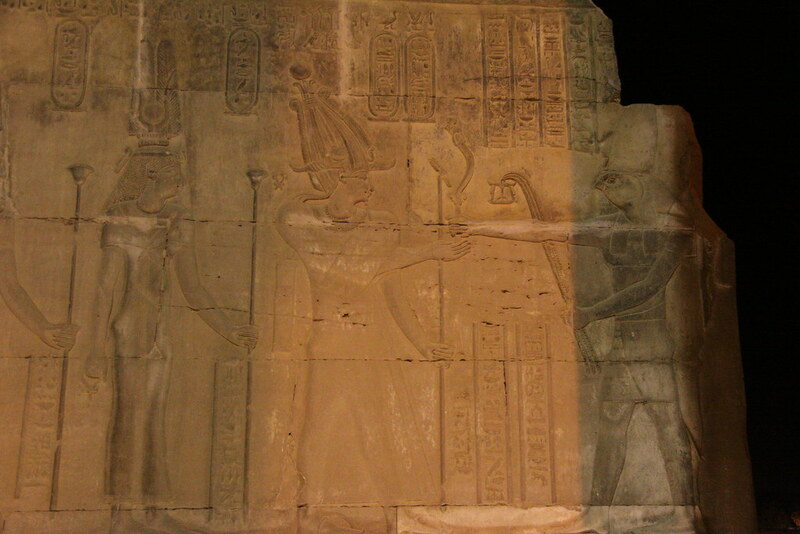 Hatshepsut established the trade networks that had been disrupted. 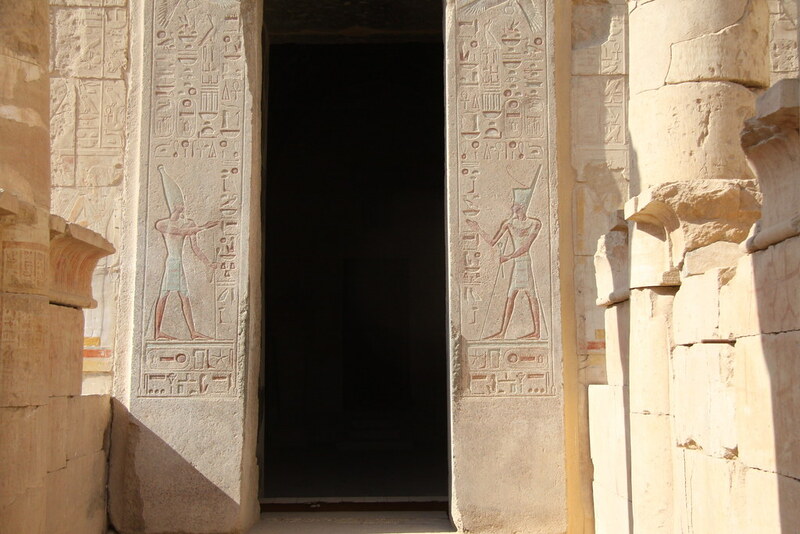 Pharaoh Hatshepsut enjoyed a peaceful and prosperous reign. 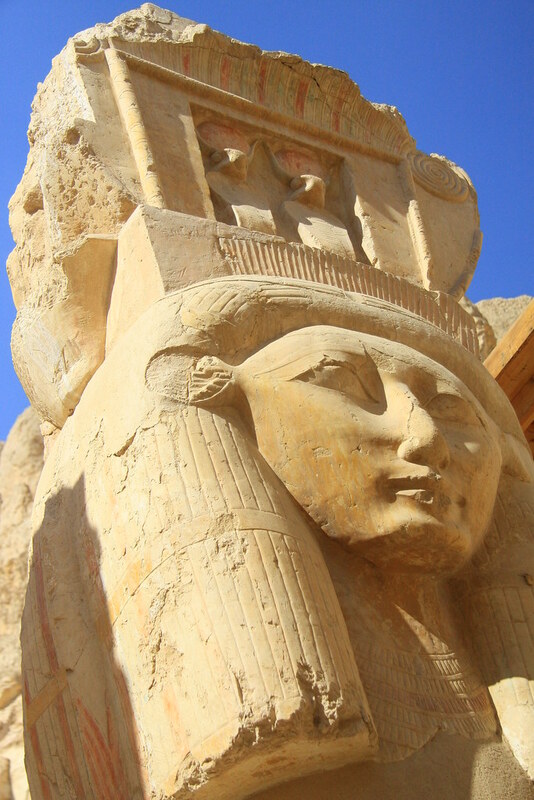 She built magnificent temples, protected Egypt’s borders and masterminded a highly profitable trading mission to the mysterious land of Punt. 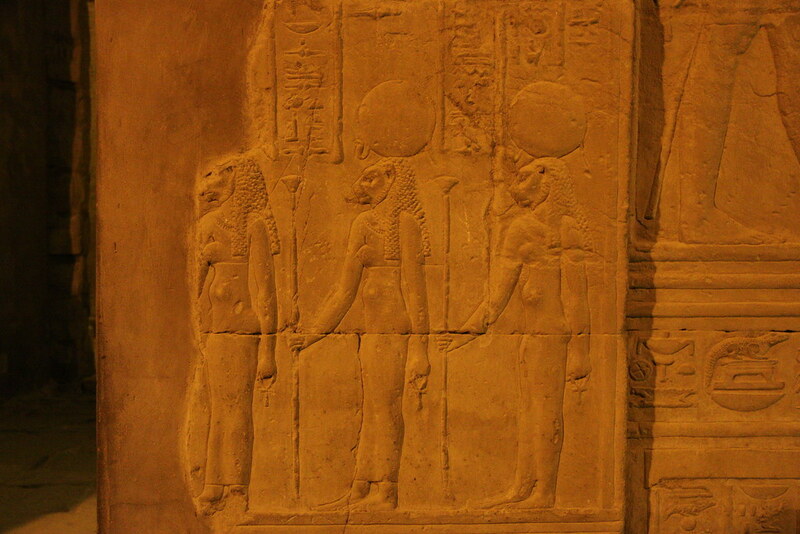 She should have been feted as one of the most successful of the 18th Dynasty kings. Not everyone, however, was impressed by her achievements. 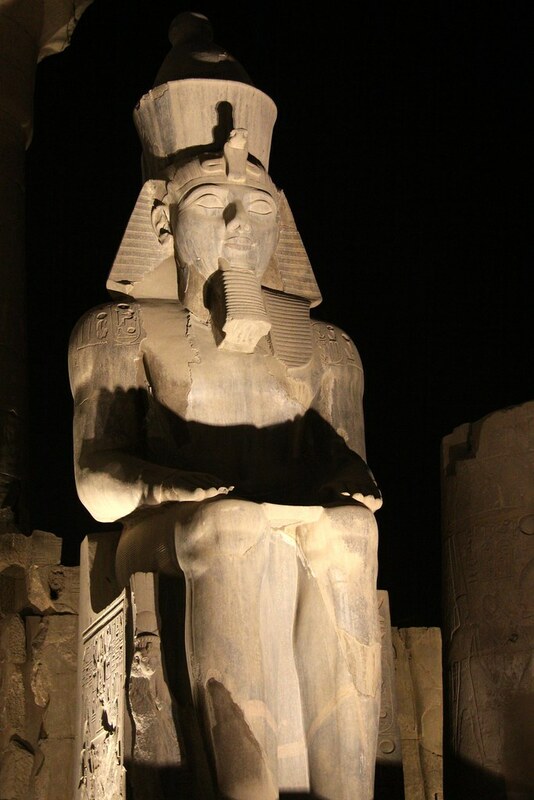 Soon after her death in 1457 BC, Hatshepsut’s monuments were attacked, her statues dragged down and smashed and her image and titles defaced by stepson, Thutmose III. 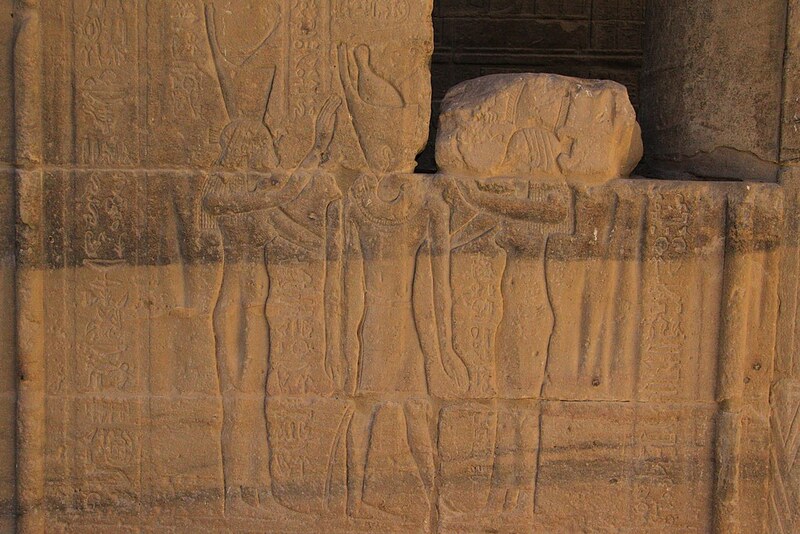 The female king vanished from Egyptian history. 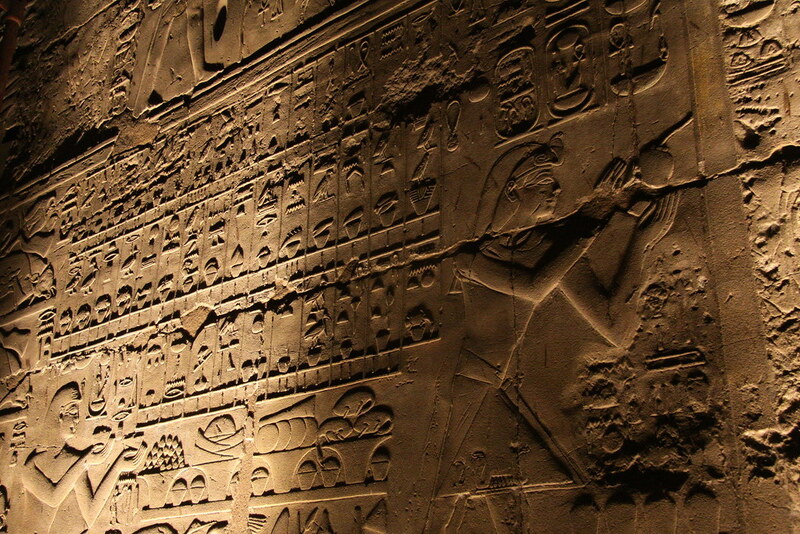 She would remain lost until, almost three thousand years later, modern Egyptologists reconstructed her damaged inscriptions and restored her to her rightful dynastic place. Last three nights and four days, thanks to GBI Egypt team, I could cycle at the last country of Africa. I want to say to them I appreciate so much about their supporting my trip. I’ve traveled with a bike, (lucky, my bike name) over two years, but this experience is so unique and special. My lucky (bike) brings so much lucky things to me. When I look at the picture of them, I feel so happy and I realize how lucky I am. 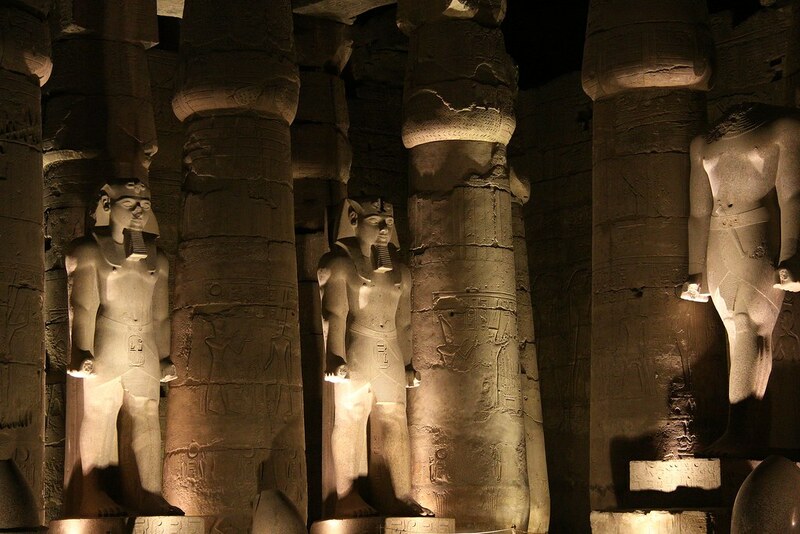 If I didn’t meet them, I only think negative thing of Egypt. Yes, there is a bad people, and there is a good people. Thanks to GBI Egypt team, I have met only good people this time. 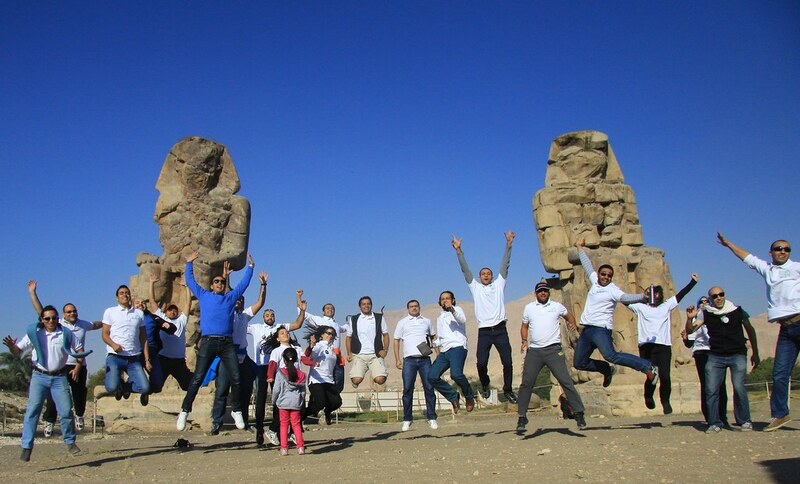 I do hope there is more sunshine on GBI Egypt team at the future. 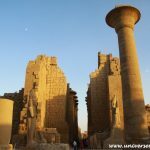 (Egypt) Where should I go? Where? For Europe!